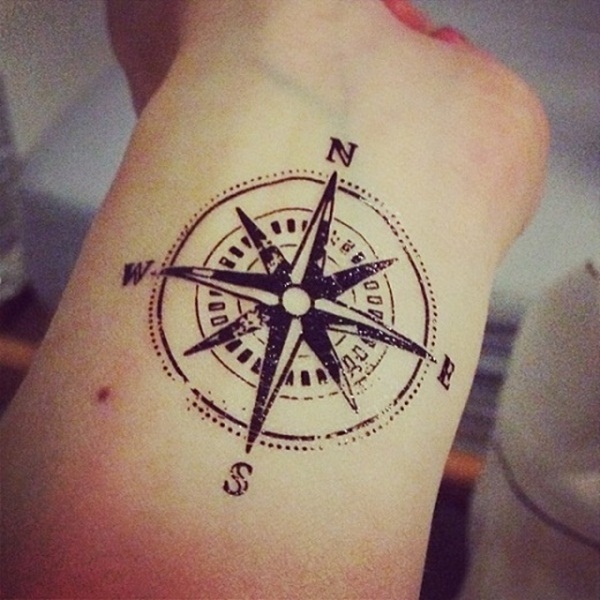 A compass tattoo is a symbolic representation of a globetrotter who loves to explore the world. 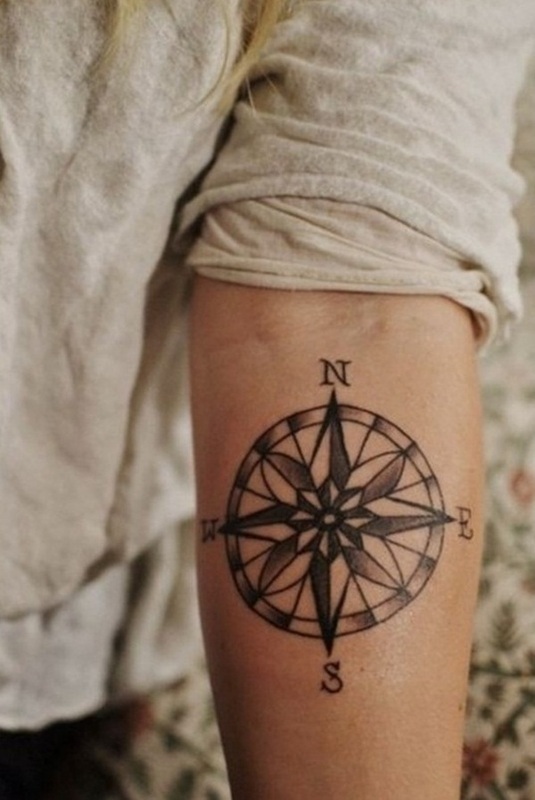 Sailors have been known to ink themselves with compass tattoos so as not to get lost while braving the unpredictable seas. 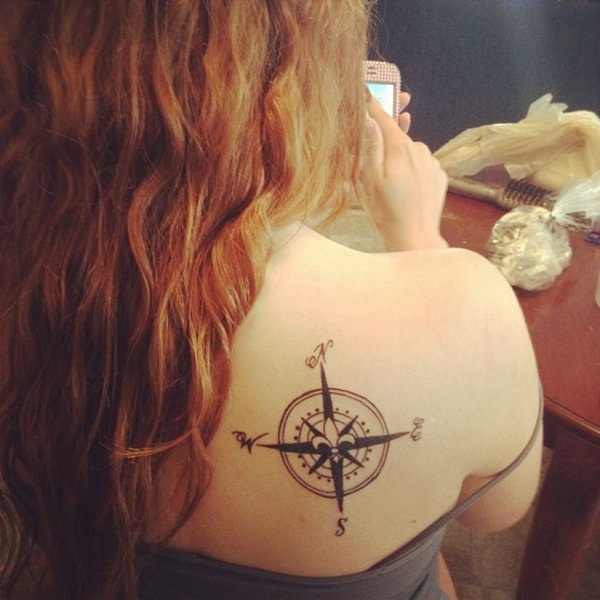 In general, compass tattoos symbolize direction, guidance, protection, and safe journey. 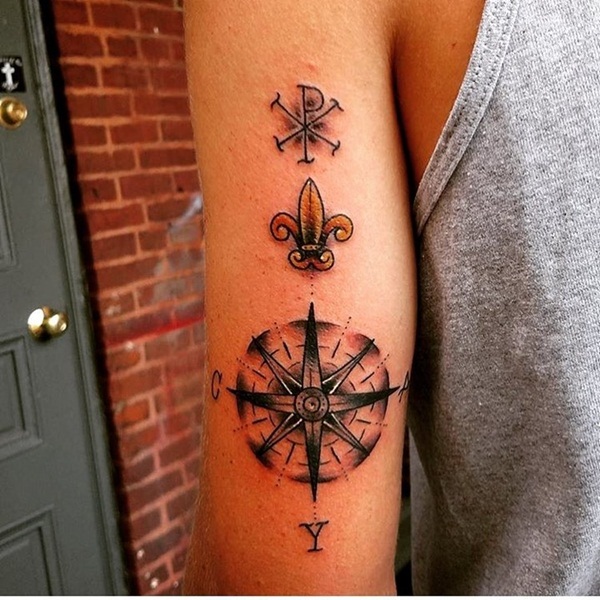 Whether you’re an adventurer who wants to express your wanderlust or simply a person who appreciates meaningful, thought-provoking tattoos, these compass tattoos will enrich your imagination and give you ideas on what tattoos to choose next. This blackwork tattoo looks simple and best suits the forearm, leg, or foot. 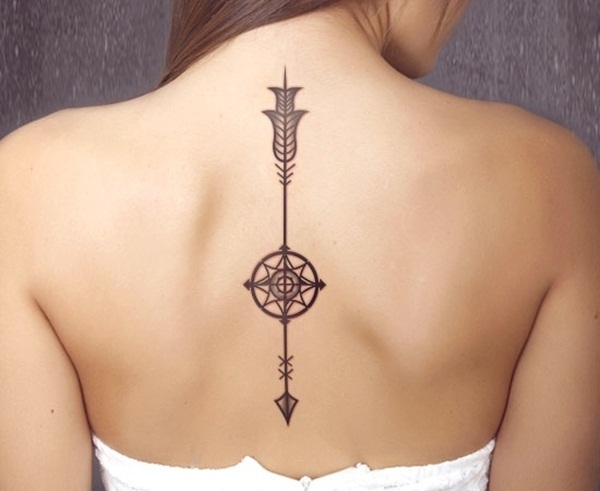 An arrow pierces through a compass in this symbolic and alluring tattoo located on the side of the body. 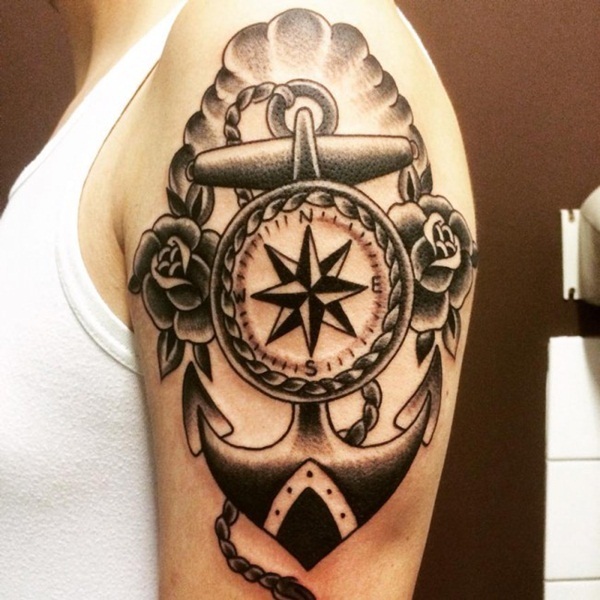 This nautical tattoo boasts realistic shading and makes for an excellent choice for an arm sleeve. 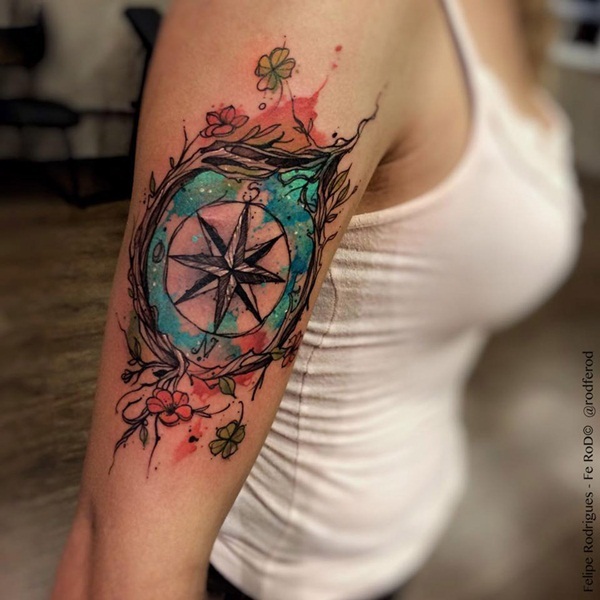 If you’re looking for a lighthearted tattoo with a feminine touch, this colorful floral compass tattoo is a great option. 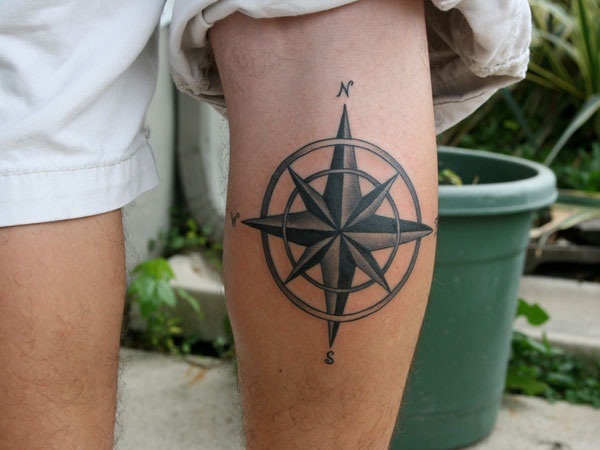 Flowers and leaves are common elements found in many compass tattoos. These matching wrist tattoos feature florals and scroll-style quotations. 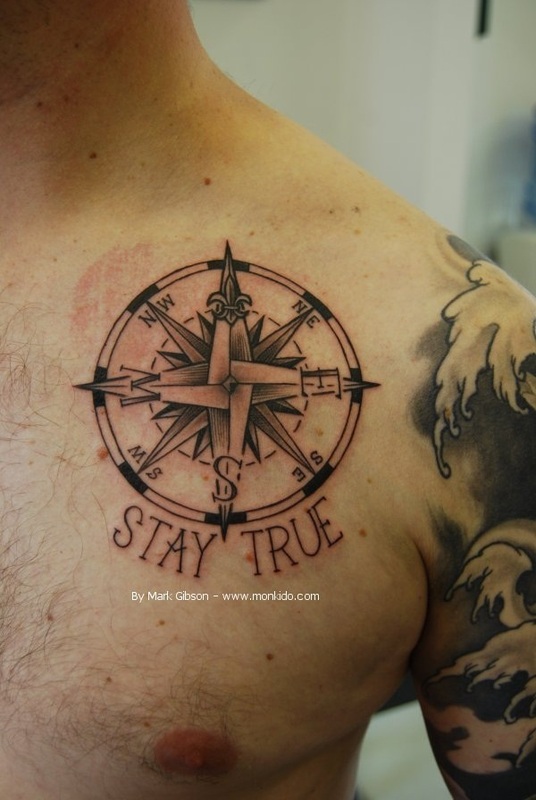 This upper chest tattoo delivers the message of staying true to yourself and being who you are. 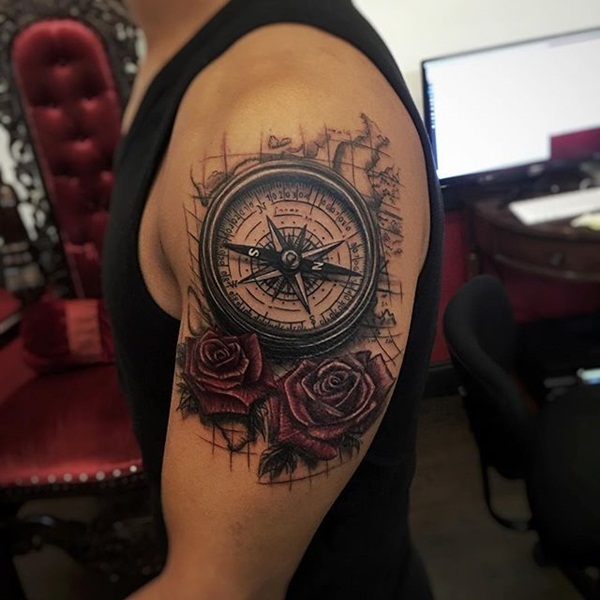 This upper arm tattoo showcases a compass in the middle of a ship’s anchor and surrounded by flowers. 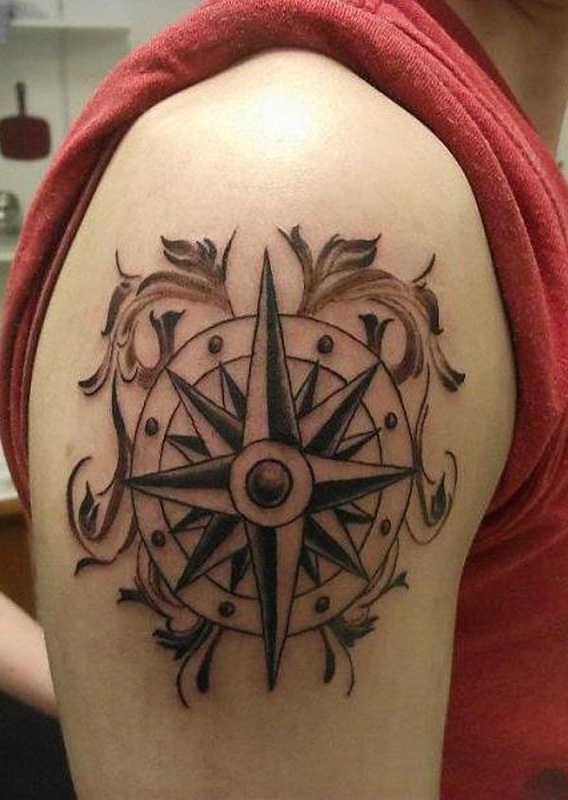 Dark shading makes this compass tattoo stand out and easily noticeable. 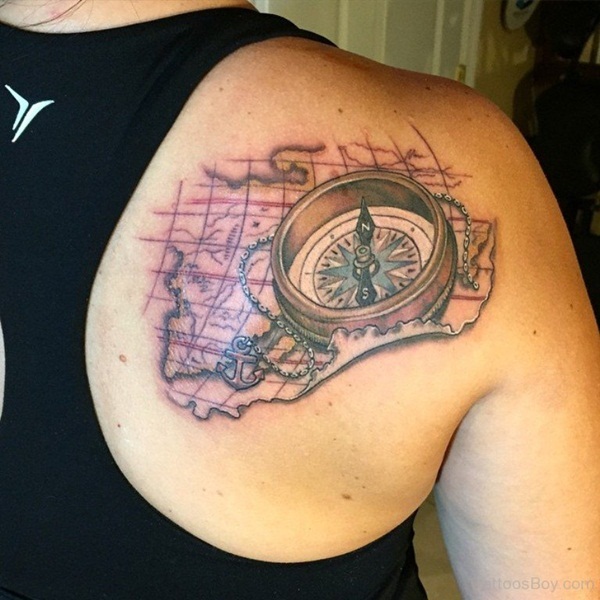 The map appears like it’s peeling off the skin, creating a more interesting back tattoo. 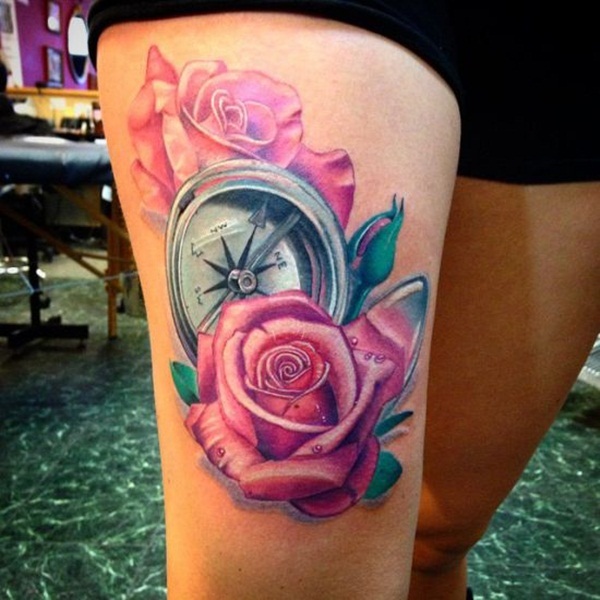 This seductive lap tattoo is characterized by rich pink, green, and silver colors. 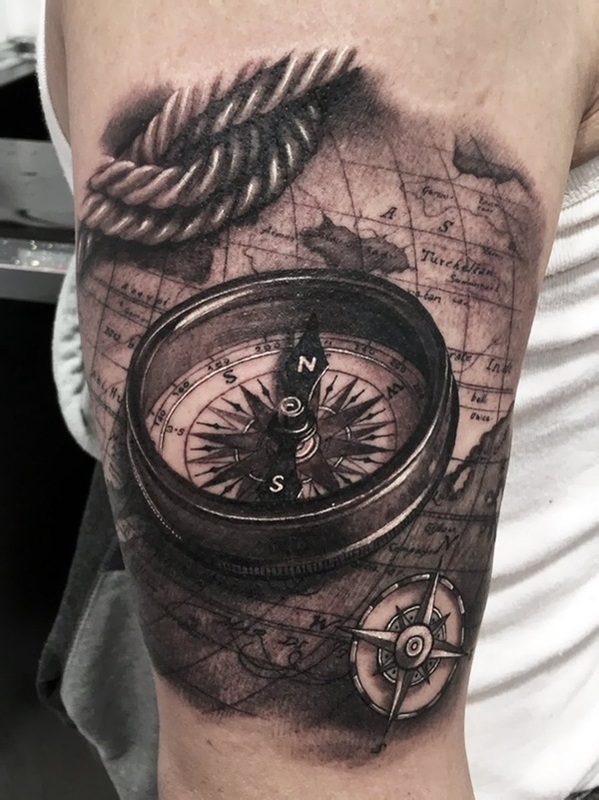 This arm sleeve uses realistic tattooing techniques. 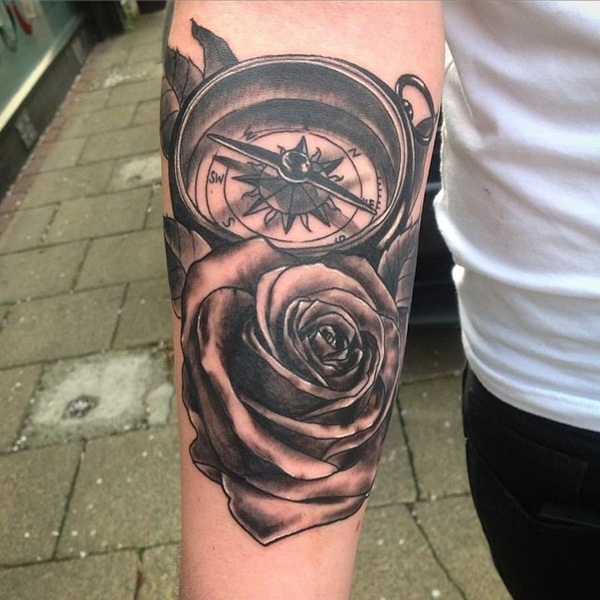 Clear black outlines and dark shades lend distinctive beauty to this upper arm tattoo. This blackwork tattoo relies on simplicity, making it a perfect choice for anyone who wants an impressive tattoo without much colors. 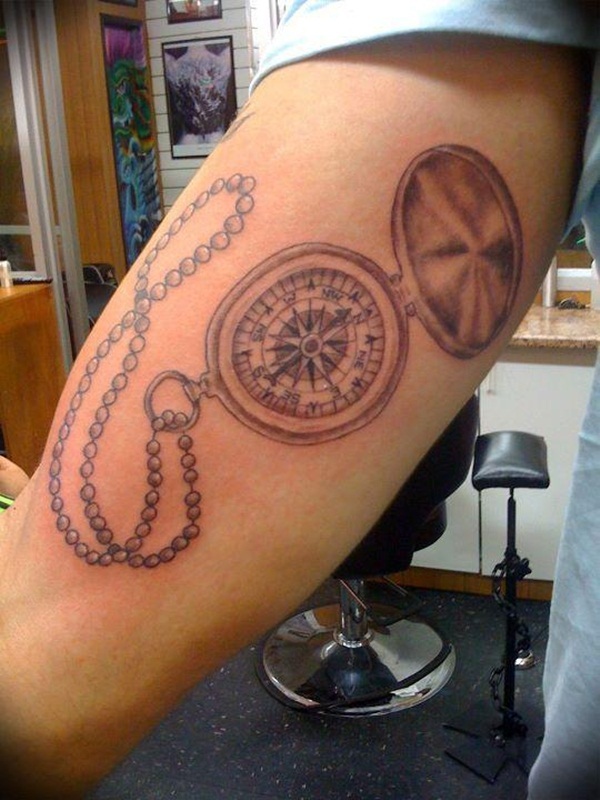 Geometric shapes differentiate this compass tattoo and make it look well-balanced. 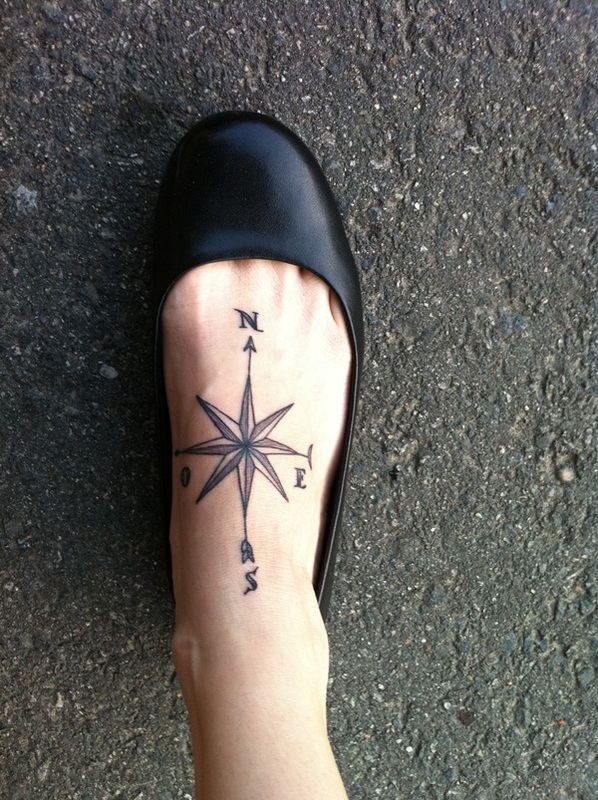 A well-proportioned compass tattoo is always a safe option when you want to imprint something on your foot. 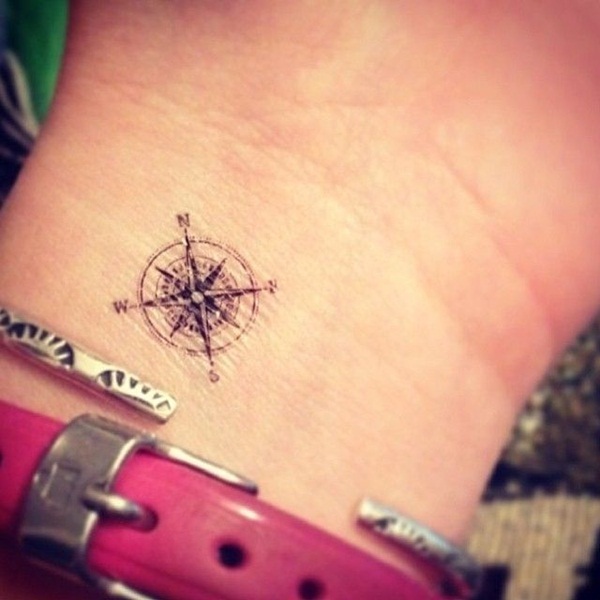 This tiny compass tattoo is barely noticeable, and it’s very easy to hide with a watch or bracelet. 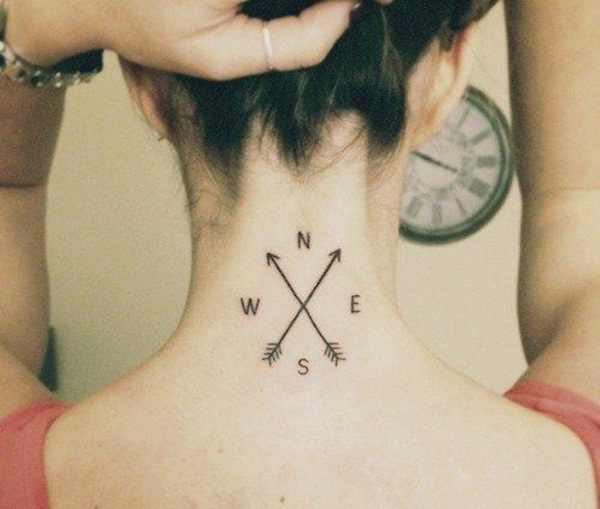 Two arrow converge in this nape tattoo, which also features very simple lettering of the four directions. 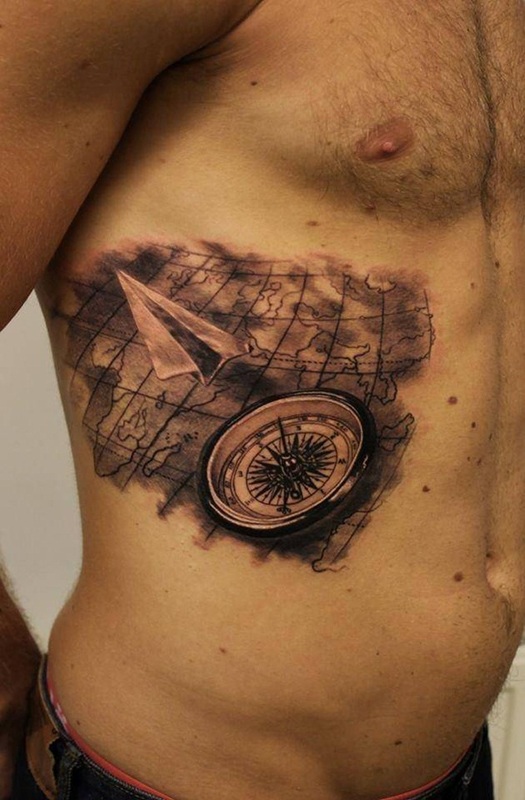 A realistic 3D tattoo is often pleasing to the eye, and it usually draws attention. 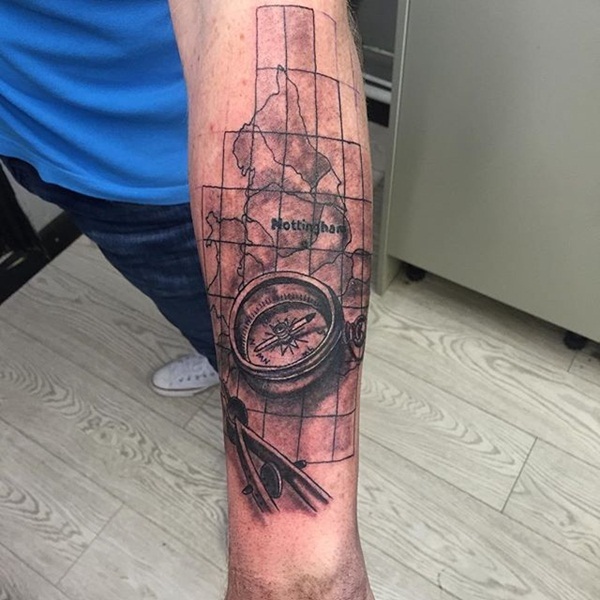 This arm tattoo showcases predominantly dark shades. 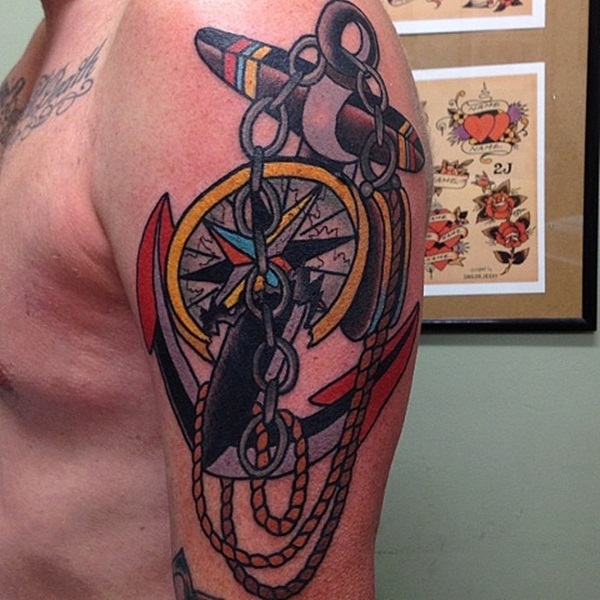 This geometric tattoo illustrates proportional shapes. 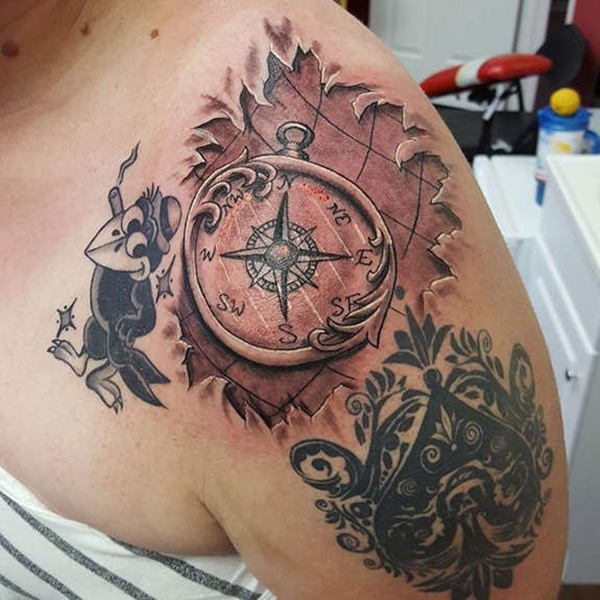 An impressive sight at first glance, this shoulder tattoo portrays a 3D compass illustration along with thick ropes and a map backdrop featuring orange and yellow hues. 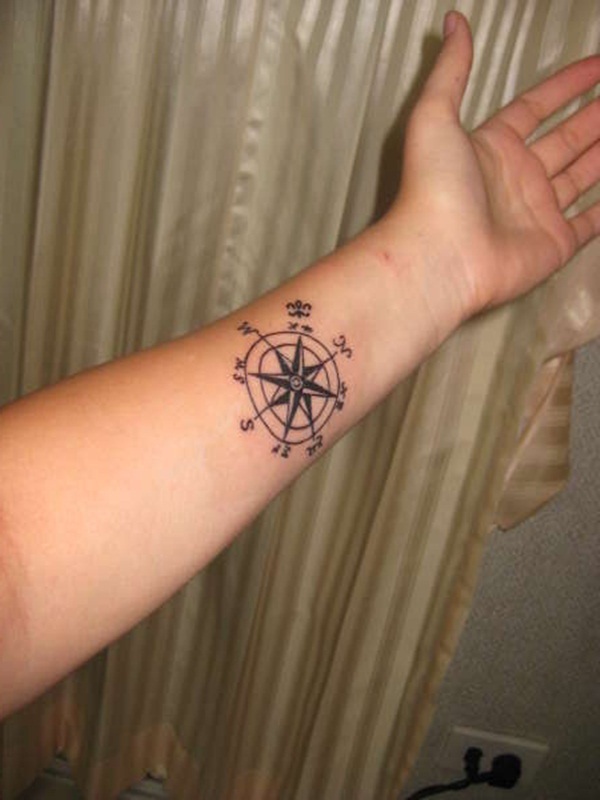 Believed to represent the North Star, this star compass tattoo is symbolic and meaningful. 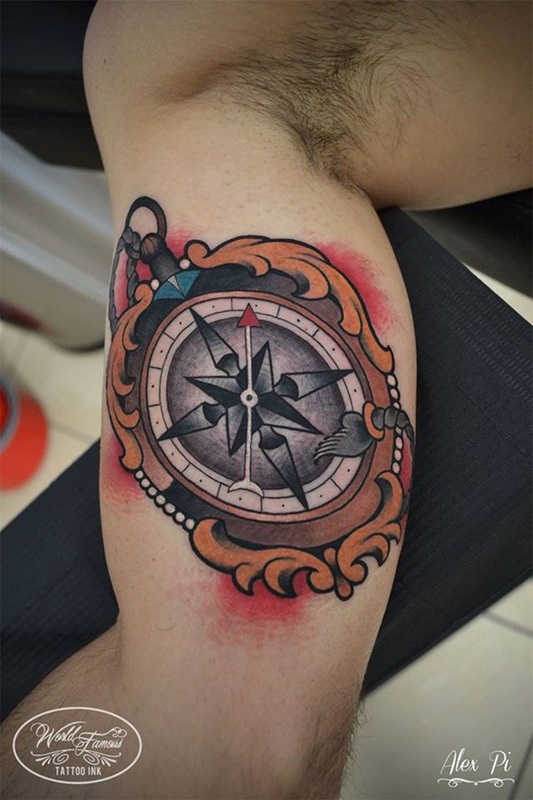 A small pop of red adds a hint of color to this blackwork compass tattoo. 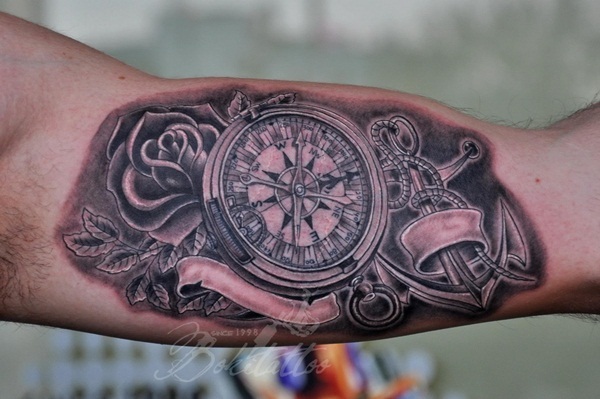 This well-crafted and highly artistic design reveals the intricate inner mechanism of a compass. 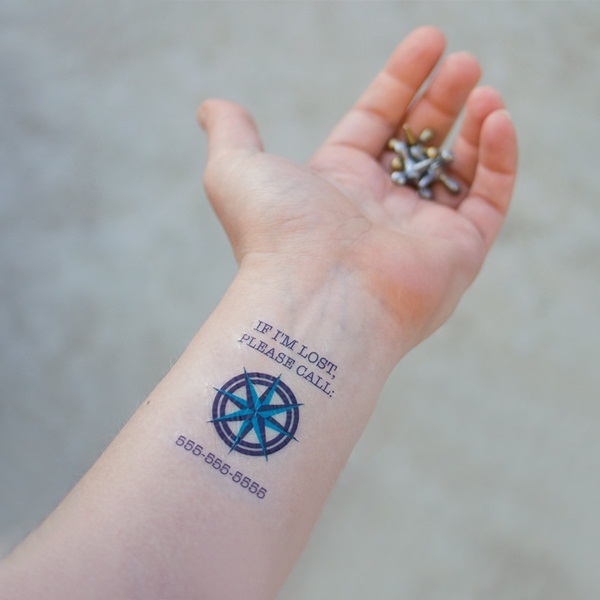 This star compass tattoo features dotwork style and shows off an inspirational phrase encircling the compass. 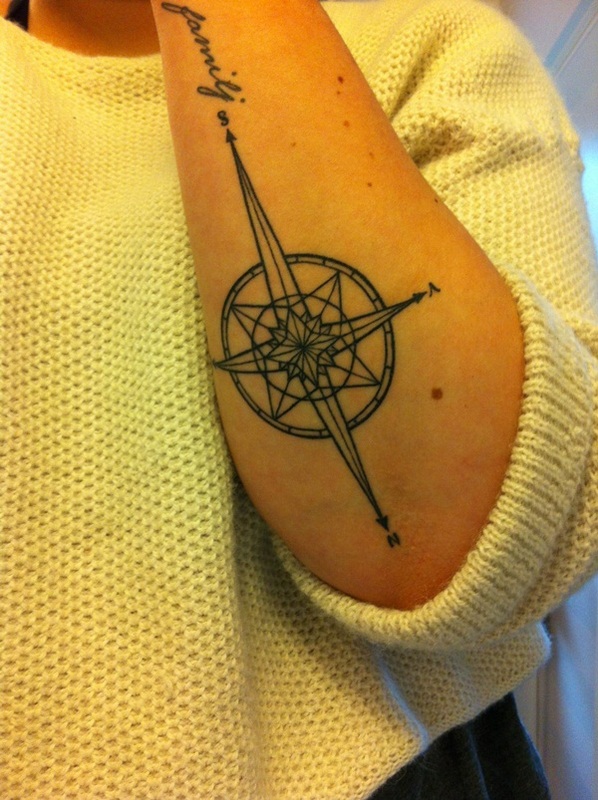 Another dotwork-style tattoo that depicts the compass as the North Star. 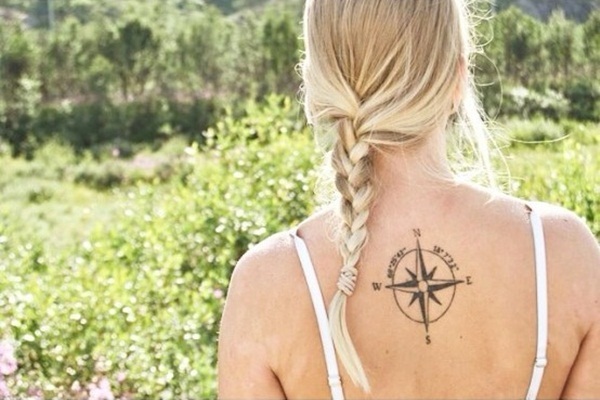 The upper back is the perfect body area to showcase this mandala tattoo. 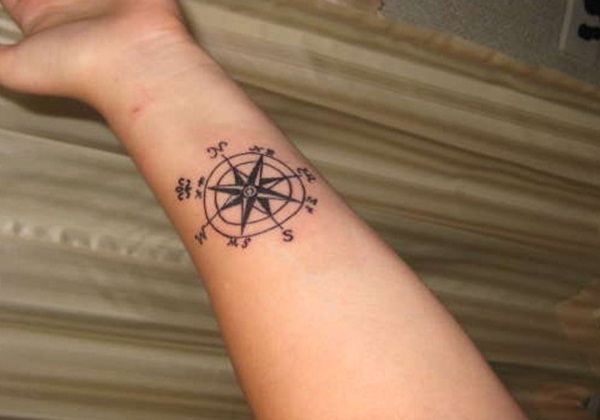 Tiny black-shaded arrows serve as markers pointing to the four directions in this star compass tattoo. 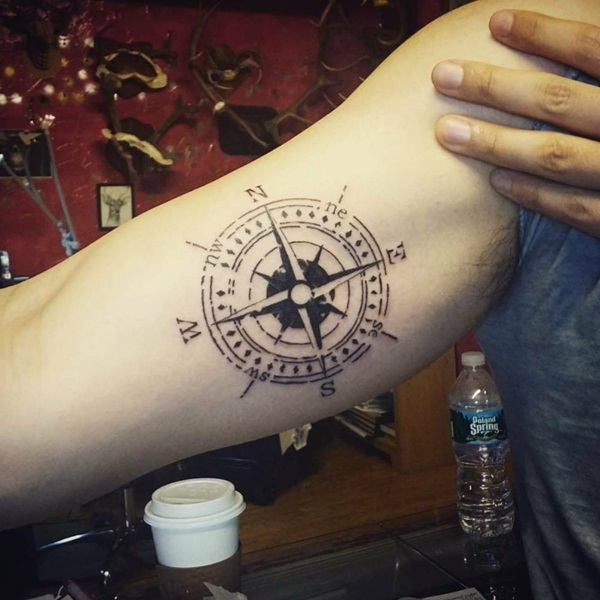 A feather lies at the tip of the arrow in this arm compass tattoo. 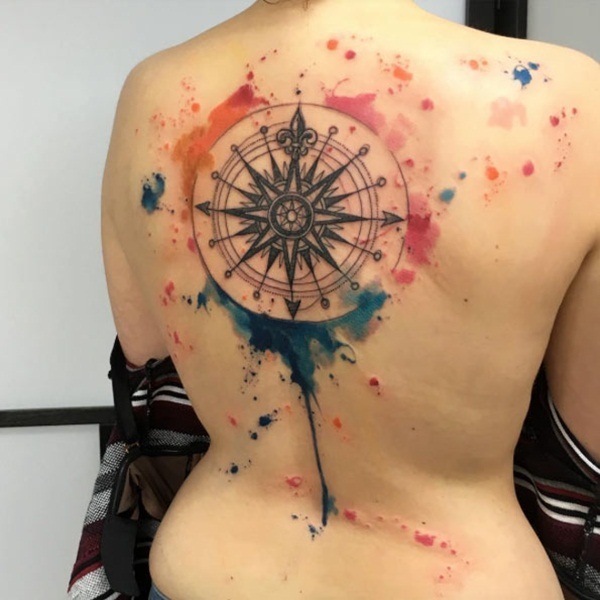 The use of watercolor tattooing technique adds color and creativity to this star compass tattoo. 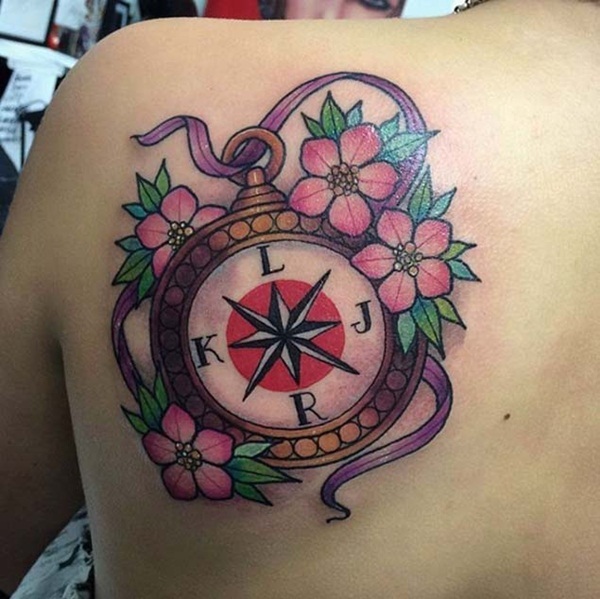 Flowers add a touch of femininity to this beautiful compass tattoo. 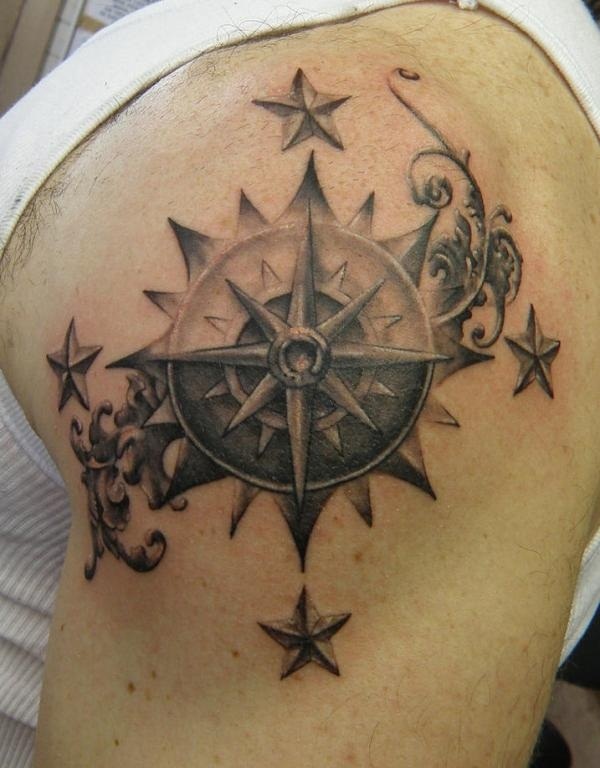 Dark black and gray shading characterize this star compass tattoo. 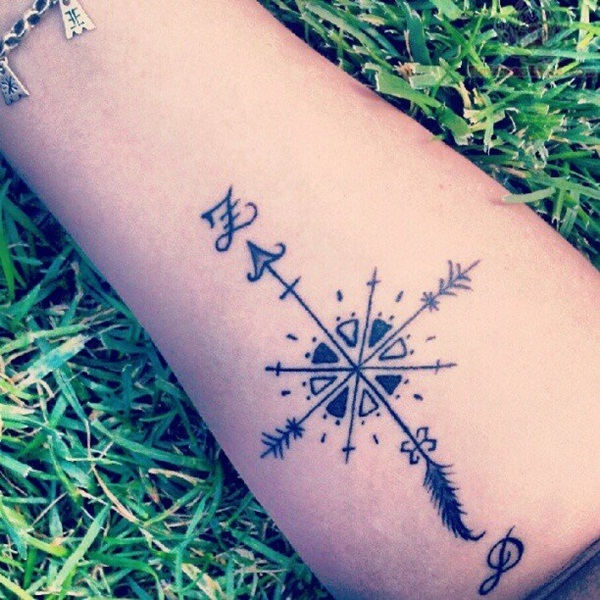 A simple but well-thought-out choice to adorn your arm. A back tattoo never fails to add allure, especially when you wear swimsuits and backless outfits. 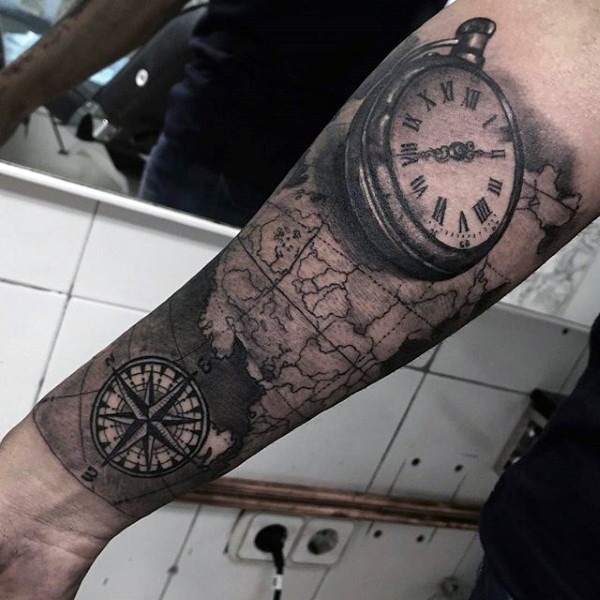 This arm sleeve showcases a combination of a timepiece, map, and compass. A fancy arrow and curvy lettering characterize this back tattoo. This wrist tattoo looks rather modern, as it shows off a print-like style. 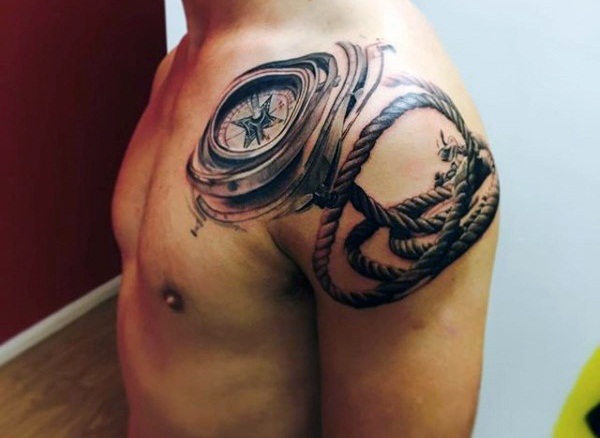 Ropes and a ship’s anchor are common elements found in most compass tattoos. 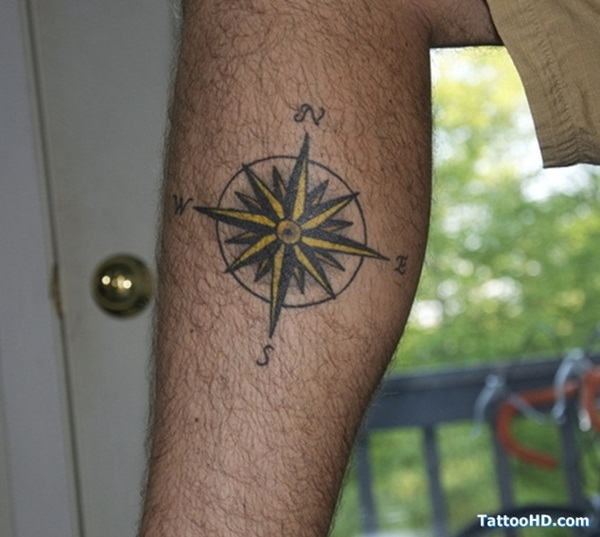 This is a simplistic star compass tattoo without much shading. 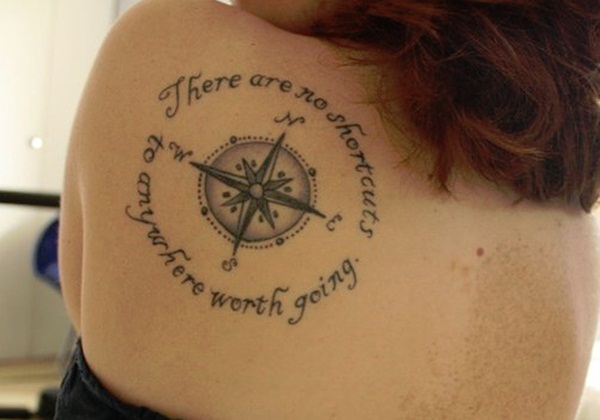 This tattoo features the inspirational quote “There are no shortcuts to anywhere worth going,” making it a perfect choice if you want a well-thought-out tattoo that reflects your positive and strong personality. 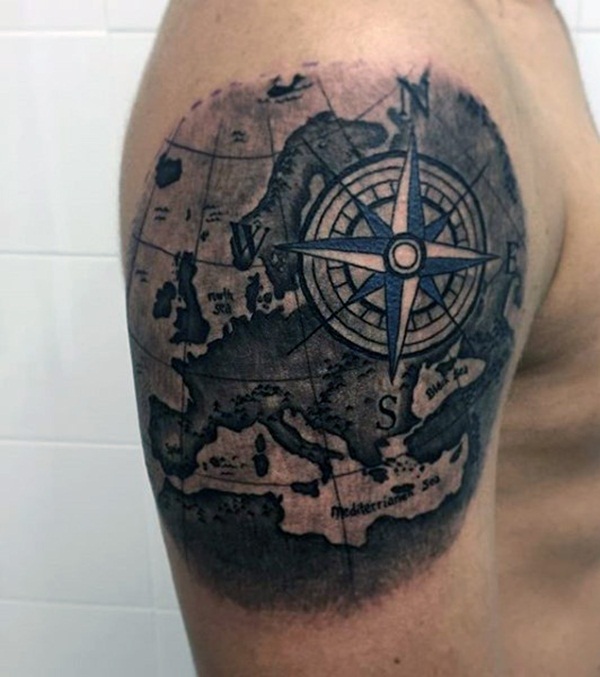 Another shoulder tattoo that depicts the essence of traveling with its map and compass design. 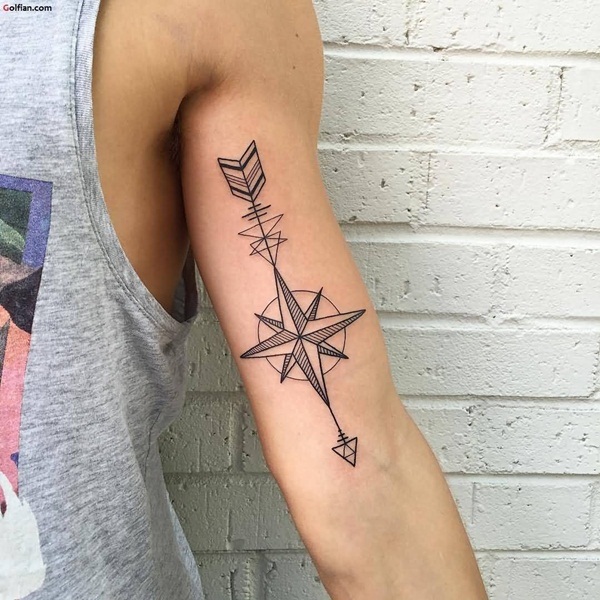 This geometric tattoo features an arrow that points to a downward direction. The paper airplane depicts air travel, while the map and compass represent the journey to various destinations. 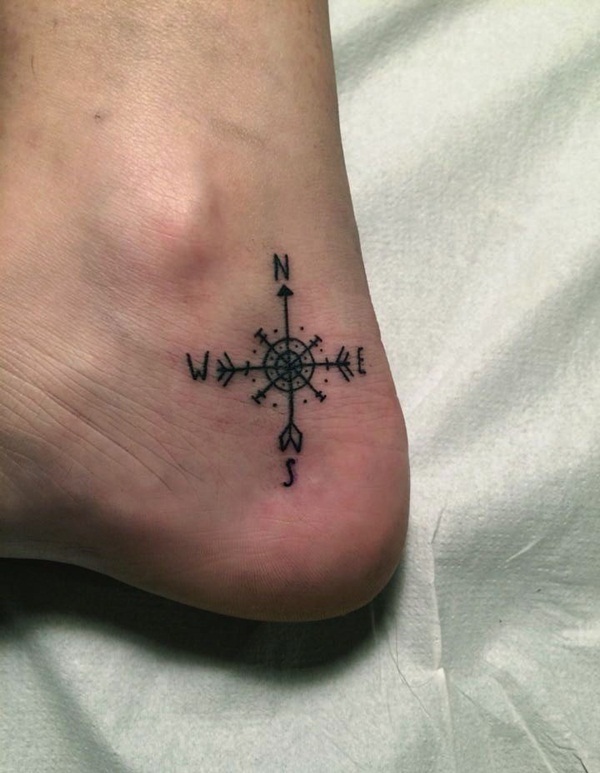 This small ankle tattoo looks cute and simple. 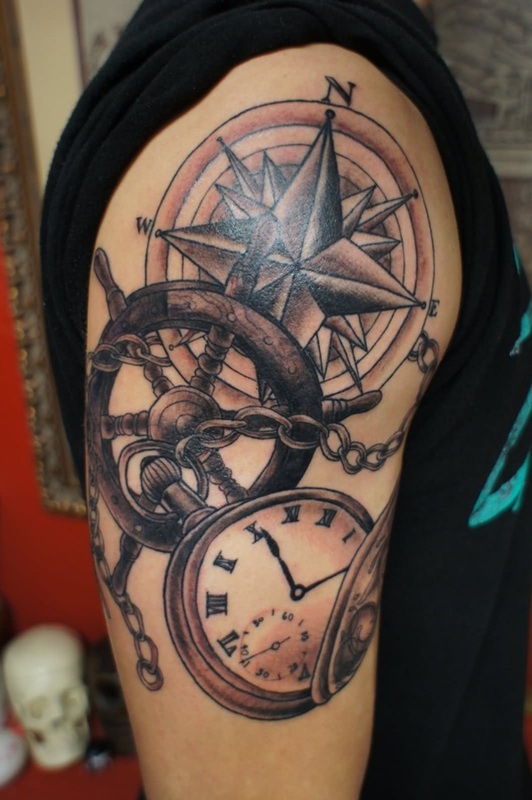 The ship’s wheel symbolizes travel over the seas, while the intertwining of the watch and compass portray the time and direction. 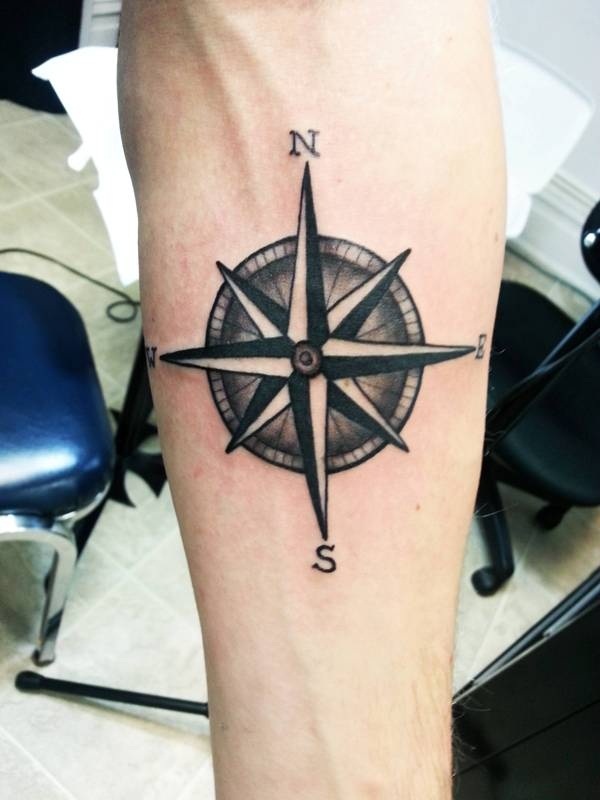 This back leg compass tattoo boasts clean lines and shading. A colorful arm tattoo with more curves rather than rigid lines. This upper chest and shoulder tattoo exudes 3D charm. 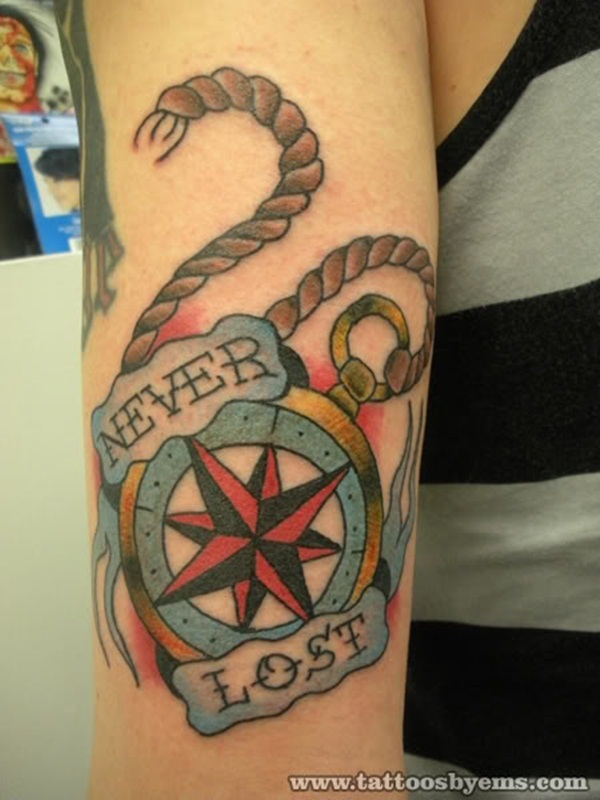 Accentuated by the phrase “Never Lost,” this tattoo likely means the person is always guided and heading toward the right direction. 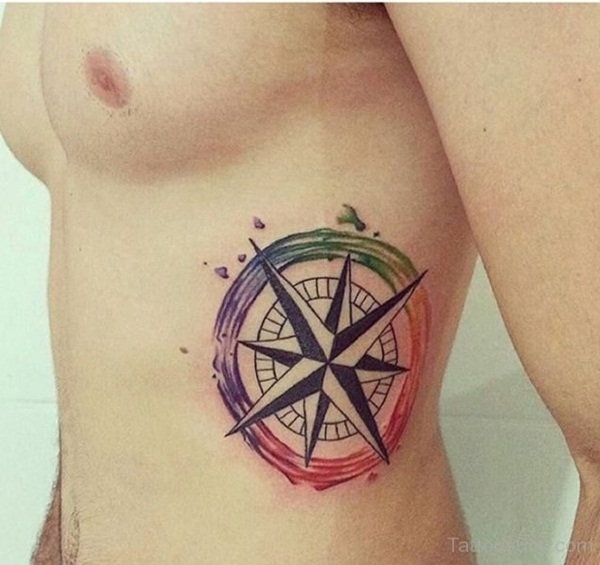 Splashes of colors encircle this wonderful compass tattoo. 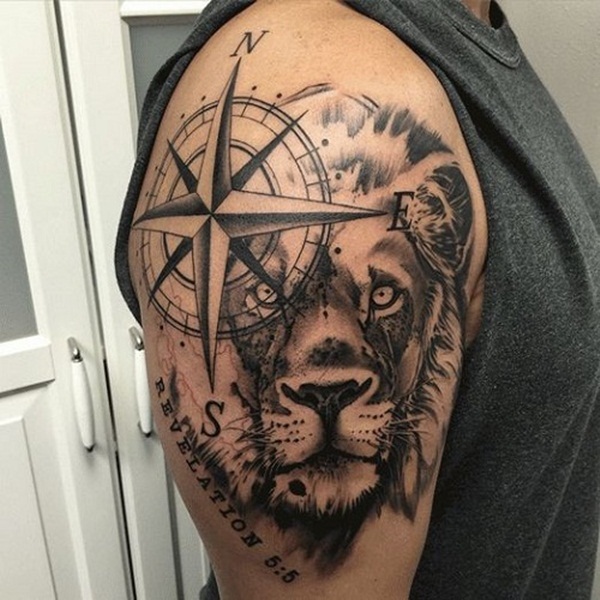 The addition of the face of a lion makes this arm tattoo look more masculine and gives the person an air of strength and authority. 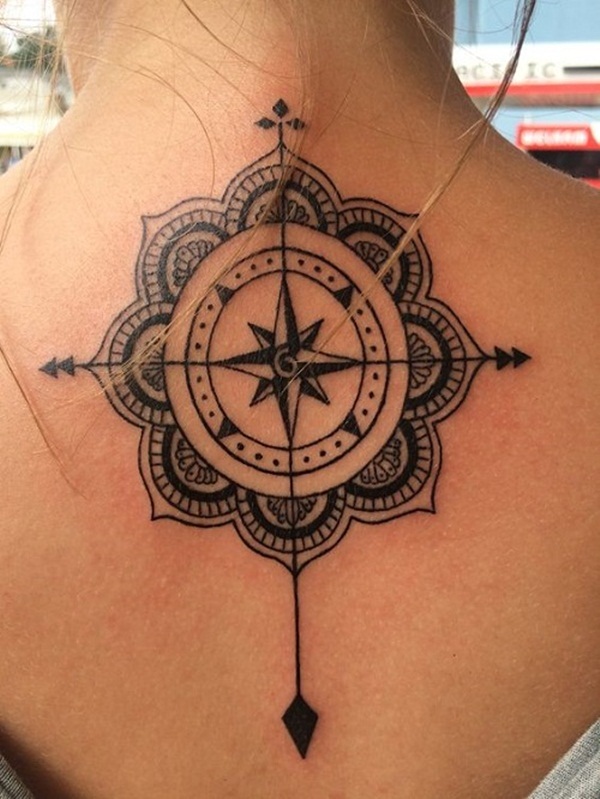 This mandala shoulder tattoo features curvy shapes and a broken circular outline. 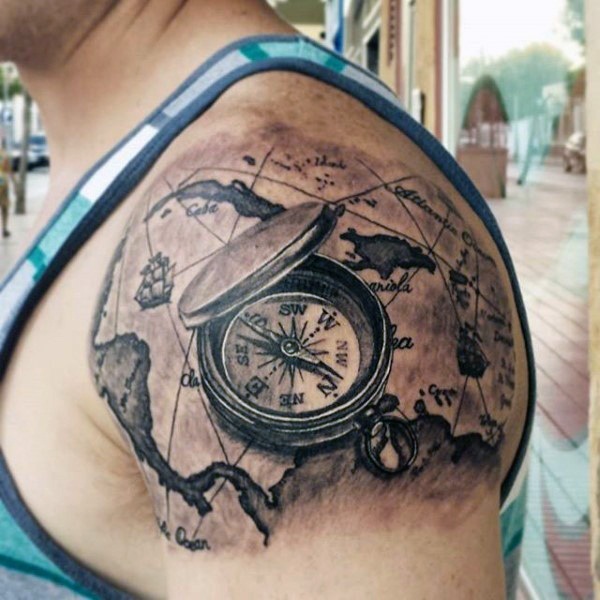 At first glance, this piece of art doesn’t quite look like a tattoo as it’s impressively inked with a realistic effect. 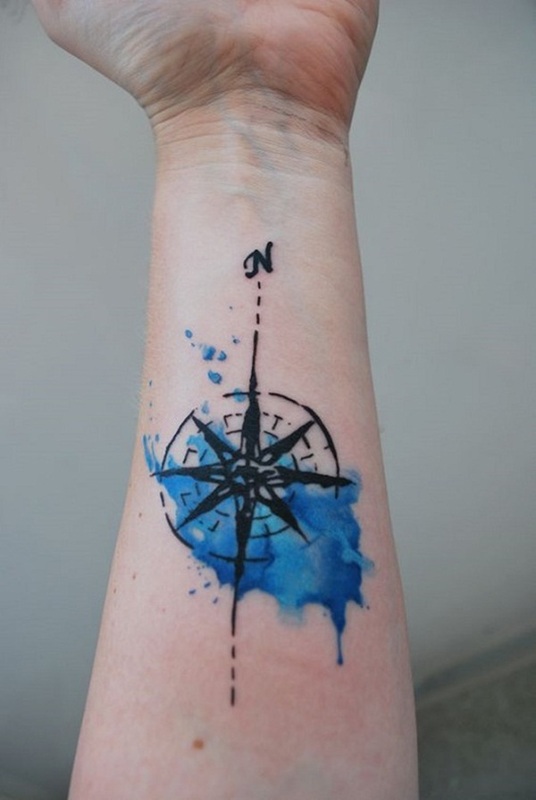 Blue is the perfect hue to represent the color of the ocean, making it an excellent choice to liven up and add meaning to this watercolor arm tattoo. 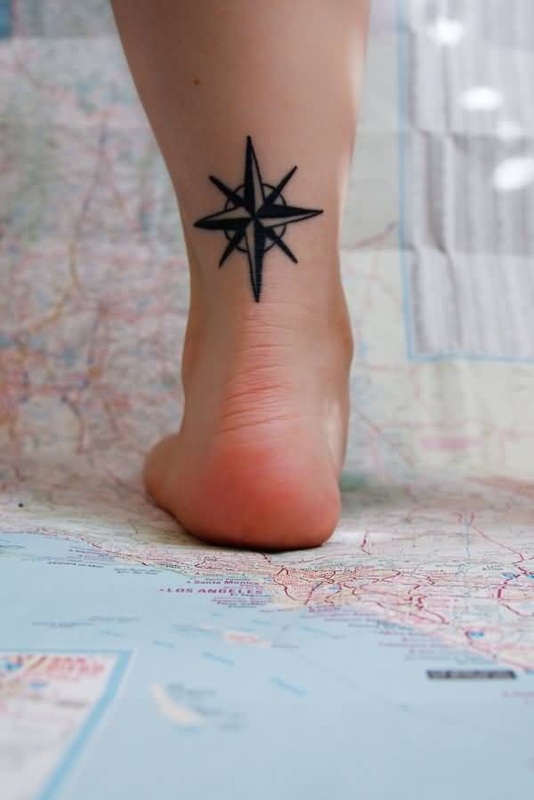 This simple black and gray upper ankle tattoo gives new meaning in putting your best foot forward. 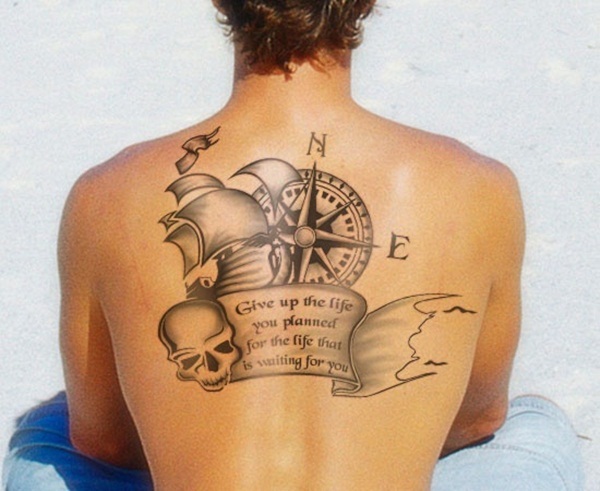 If you’re fond of pirate stories and you yearn to explore the seas like pirates, this pirate-themed back tattoo is an excellent design. The quote “give up the life you planned for the life that’s waiting for you” implies that you should pursue a life of freedom instead of trudging a cookie-cutter path. A very artistic tattoo that shows the skilled craftsmanship of a tattoo artist. 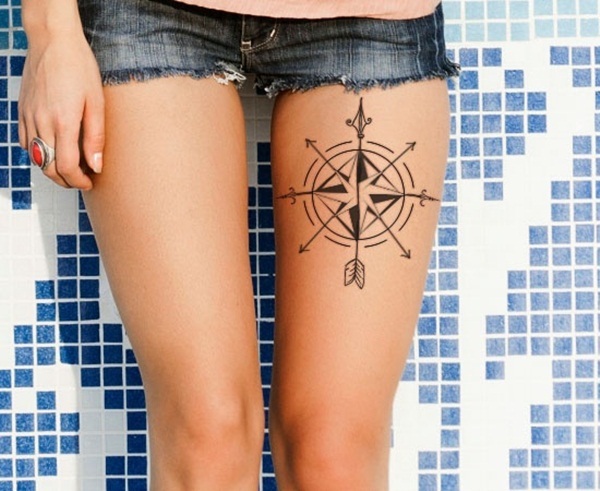 If you want to spice up your look, especially during summer months, this compass tattoo on the lap is a great choice. 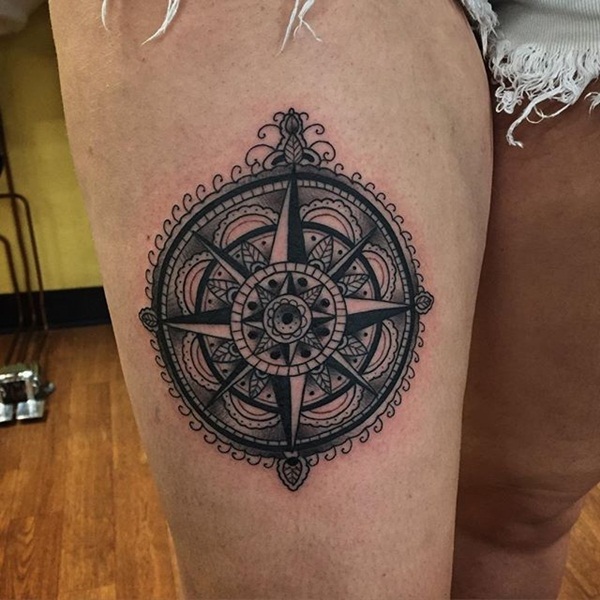 This compass tattoo shows off clean lines and ample shading. 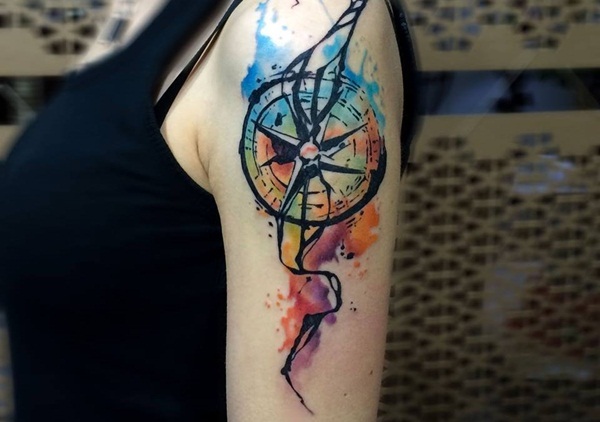 Another amazingly artistic tattoo that gives a twist to the compass tattoo by depicting a star compass inside a dream catcher, which is believed to “catch” bad dreams so a person sleeps soundly each night. 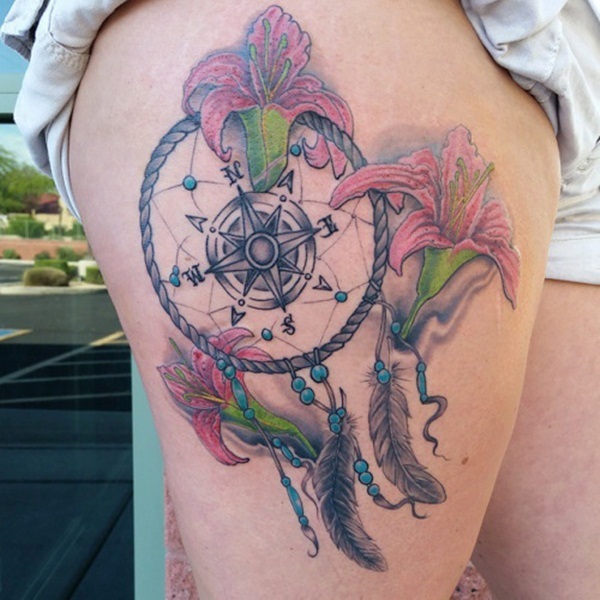 Feathers and pink flowers complete the look of this fantastic thigh tattoo. 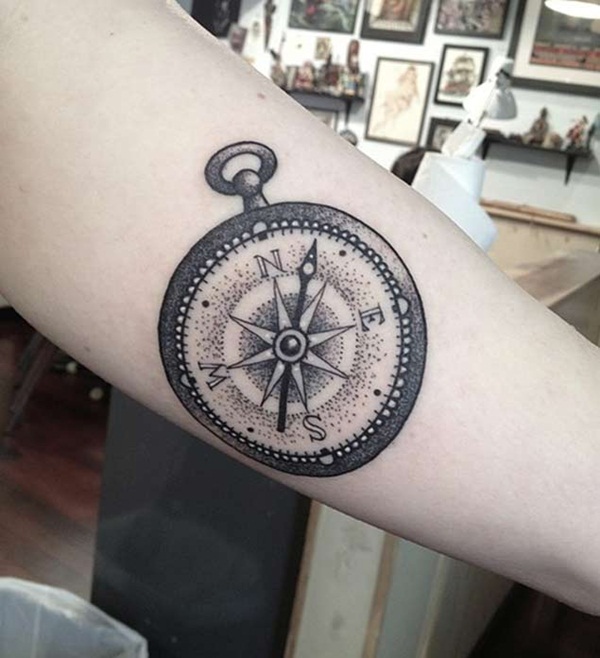 A dotwork-style tattoo that’s placed under the upper arm. 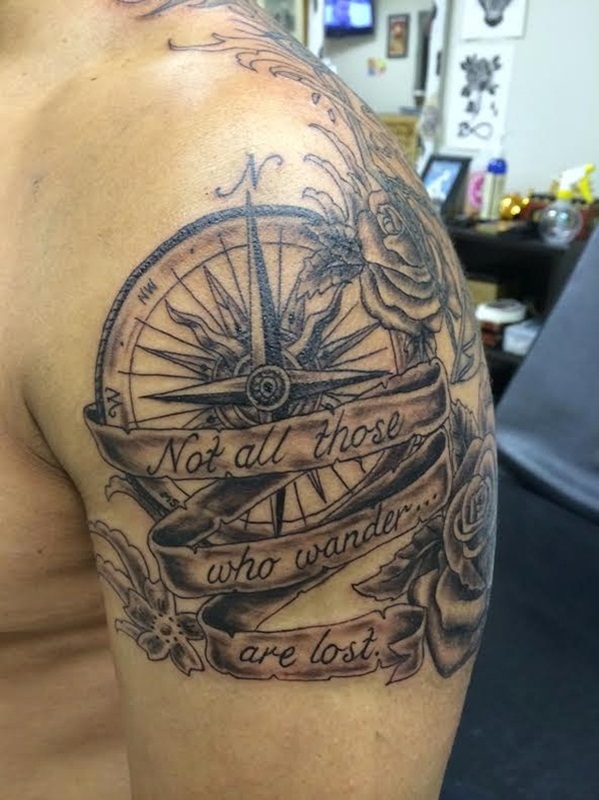 “Not all those who wander are lost” is a thought-provoking quotation that perfectly suits this compass tattoo, as it means that travelers who “wander” and explore various places know that they are following their dreams and passion. 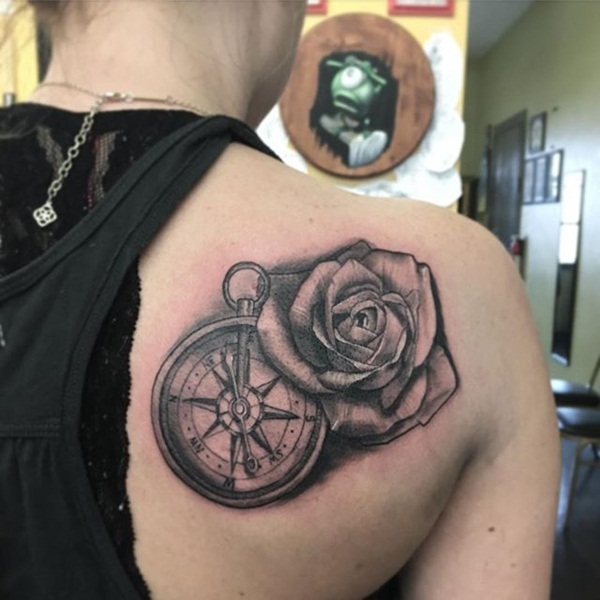 A touch of realism makes this shoulder tattoo easily noticeable. 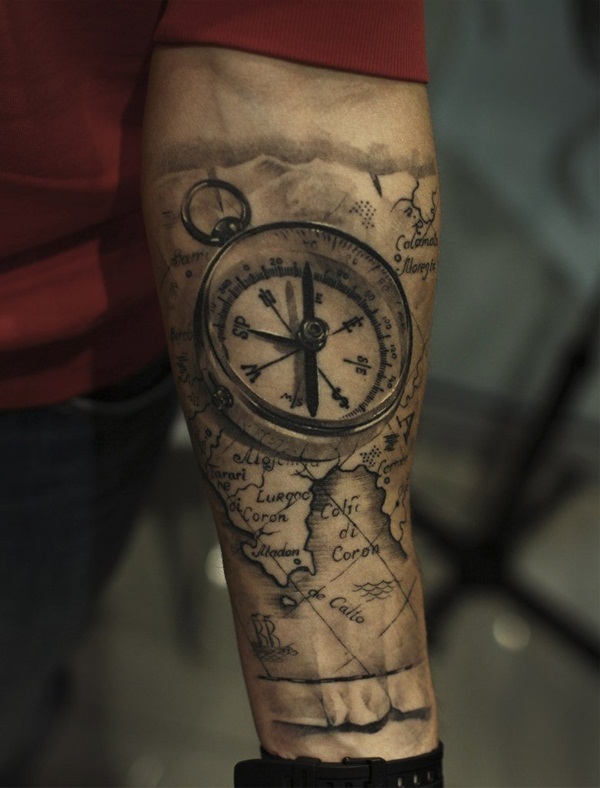 Like most other tattoos on this list, a map accompanies the compass, thus symbolizing journey, direction, and wanderlust. Twigs and flowers crawl around this beautiful watercolor-style arm tattoo. 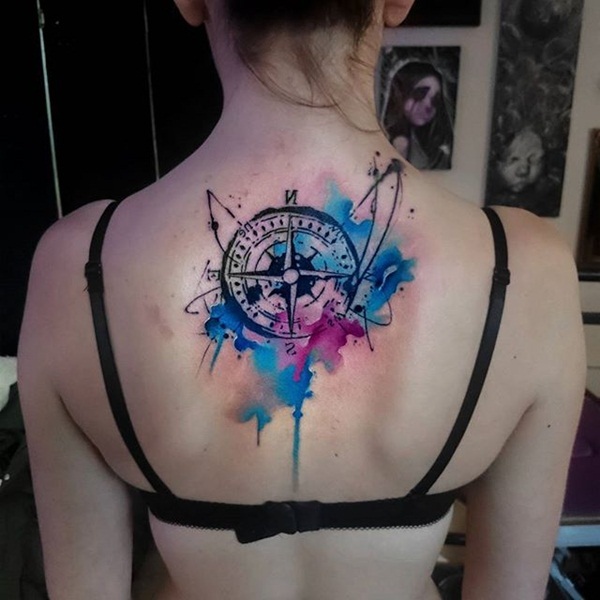 Another stunning watercolor tattoo with predominantly splashes of black, blue, and purple hues. The back of this person appears like a gorgeous canvas splattered by hints of black, blue, red, pink, and orange colors. 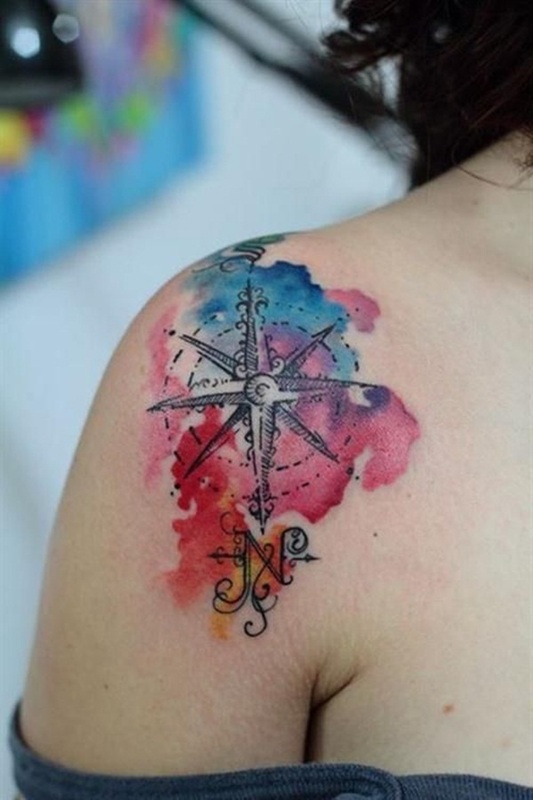 Warm colors such as sky blue, orange, and yellow are common hues found in watercolor compass tattoos, as they are the colors of the ocean and sky. 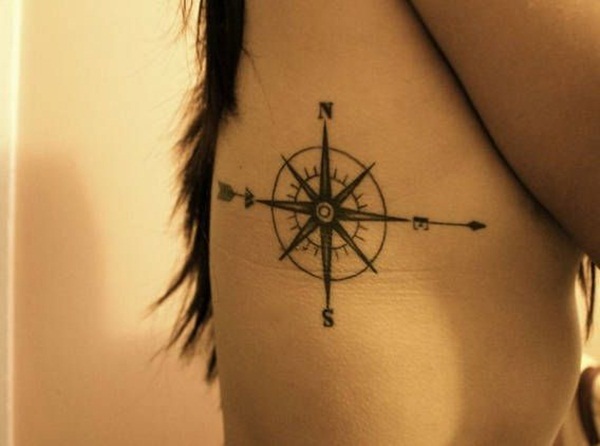 Pointing downward, this arrow and compass tattoo lies right in the middle of the back, creating a sense of balance. 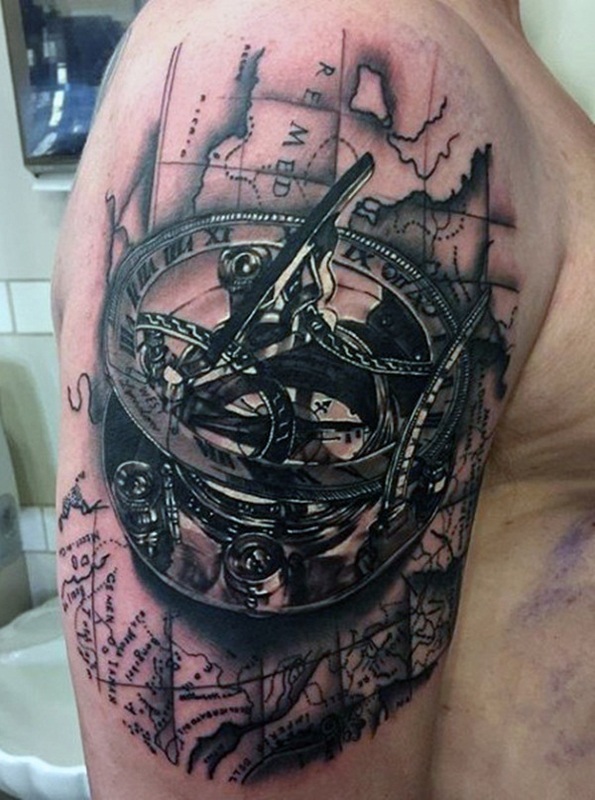 Brown and black shades meld together in this compass and map tattoo. 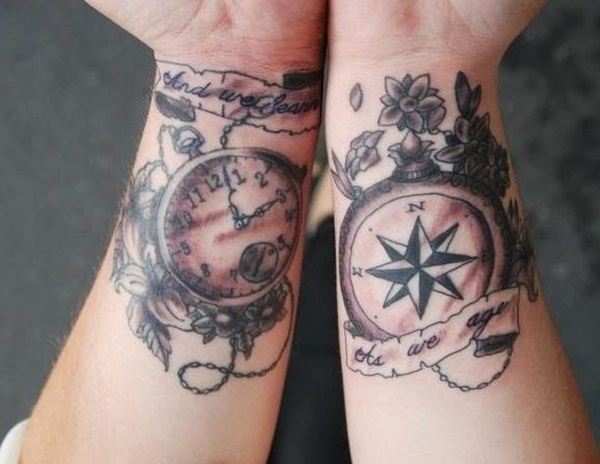 A cute compass tattoo with cursive writing that’s perfect for a lady. 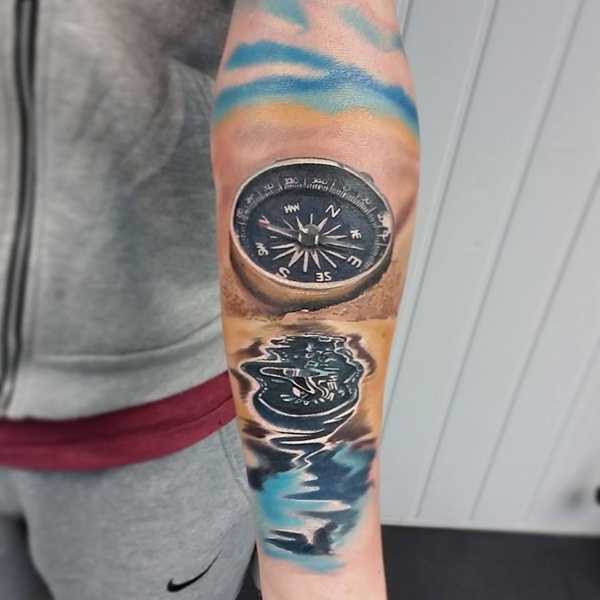 Featuring a combination of 3D and watercolor techniques, this stunning arm sleeve is amazingly brought to life. Tinges of blue run up the arm, while a wavy reflection of the compass can be seen near the wrist, giving the illusion of a compass lying near the seashore and beneath blue skies. 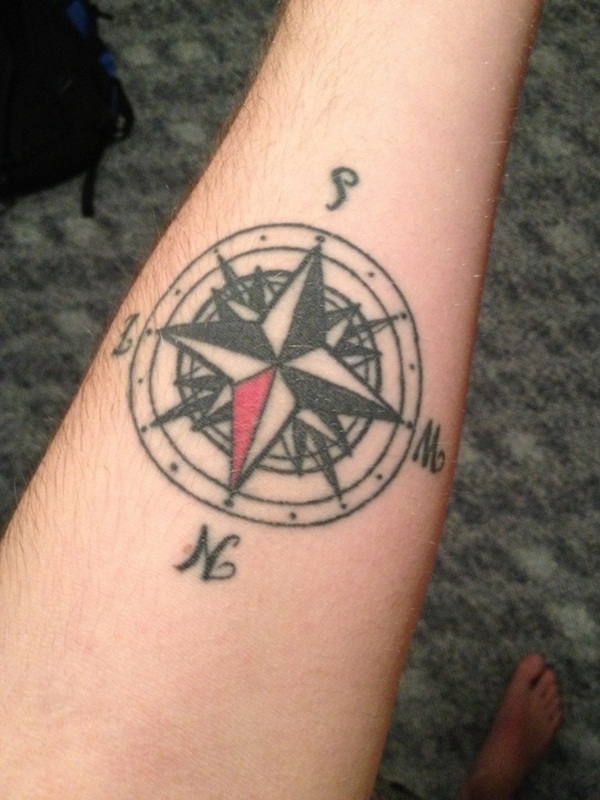 If you don’t look closely, you’ll likely think that this realistic compass is simply an accessory rather than a tattoo. 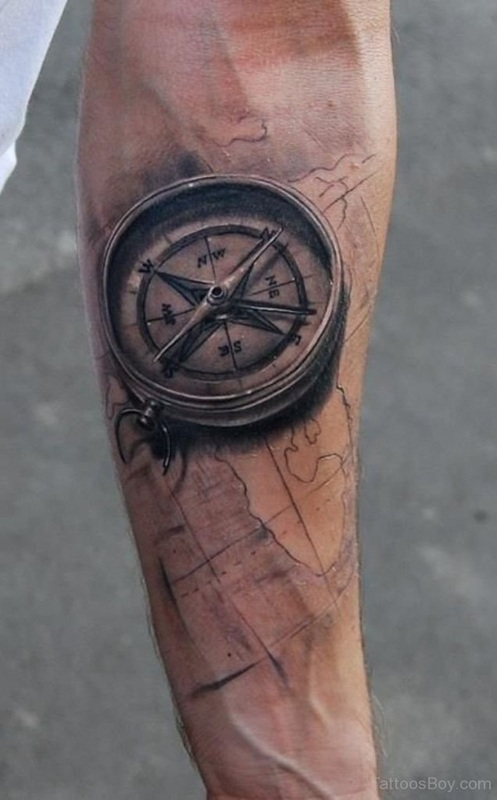 Skillful shading makes compass tattoo pop out and look like it’s wrapped around the arm. 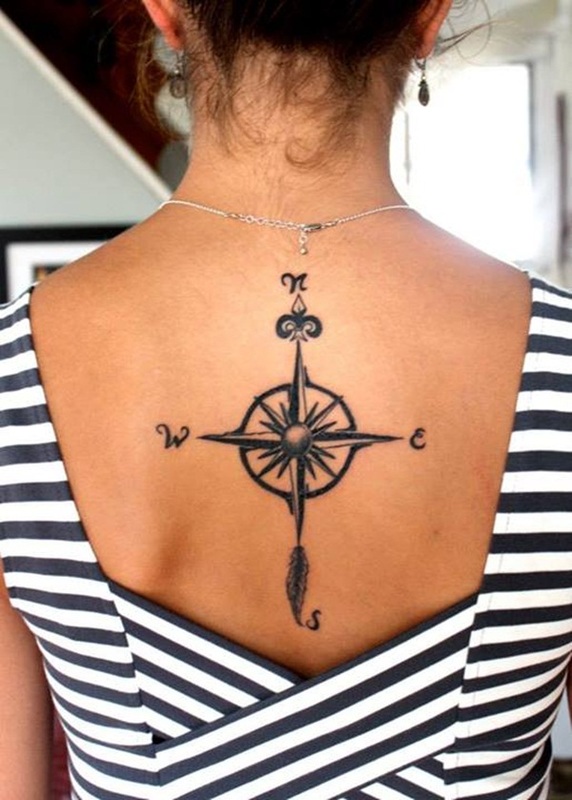 Stars and distinctive shapes make this shoulder tattoo stand out. 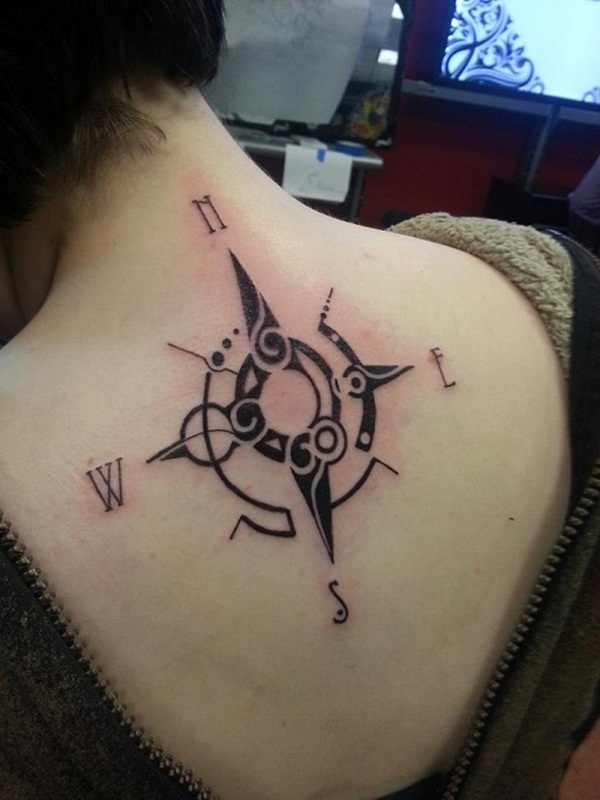 This star compass tattoo looks like a shield protecting the arm. 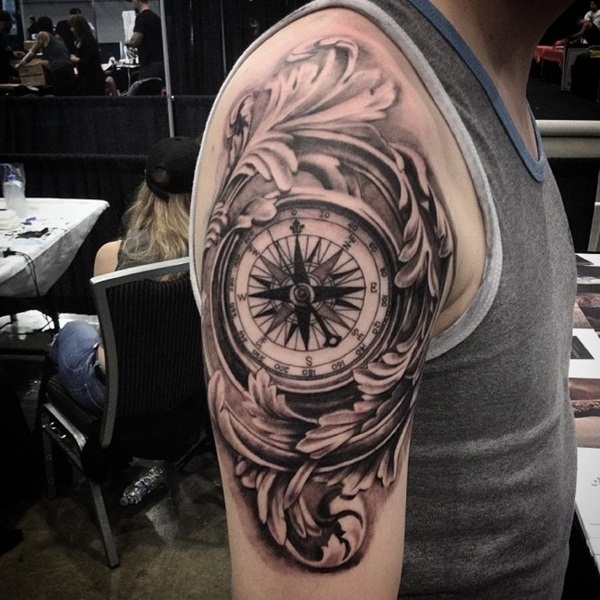 With its distinctive shapes and lines, this black and gray tattoo looks quite unique. 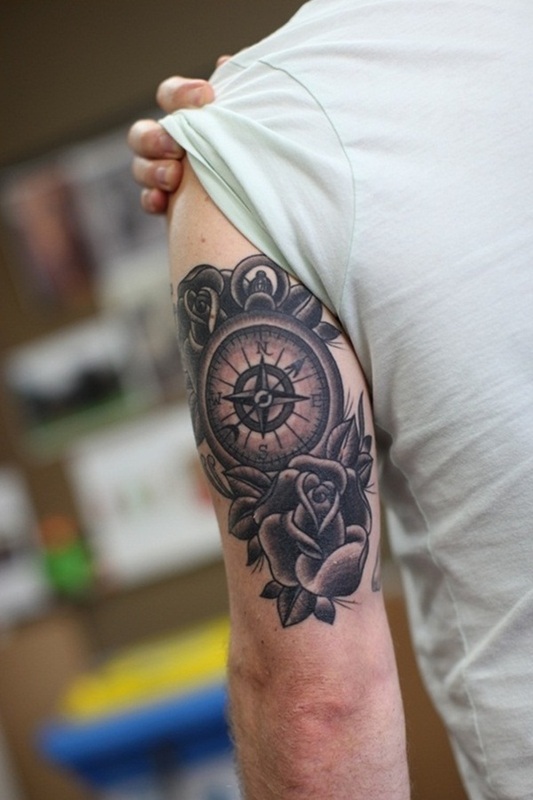 Roses and flowers are typical elements found in many compass tattoos. 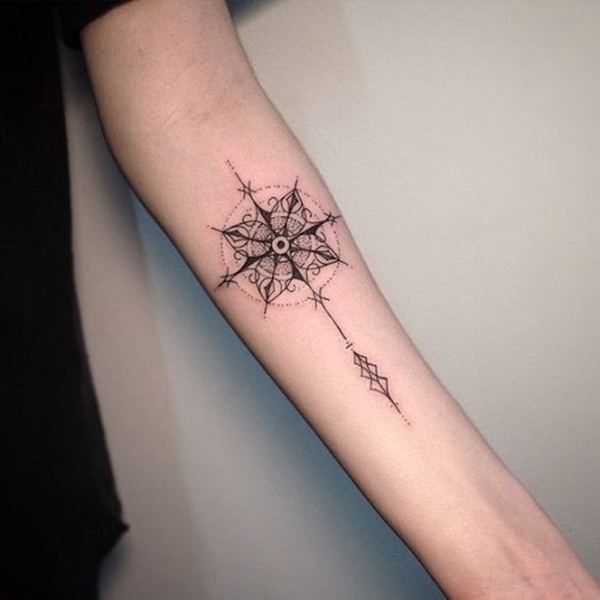 This dotwork tattoo looks simple but rather appealing. 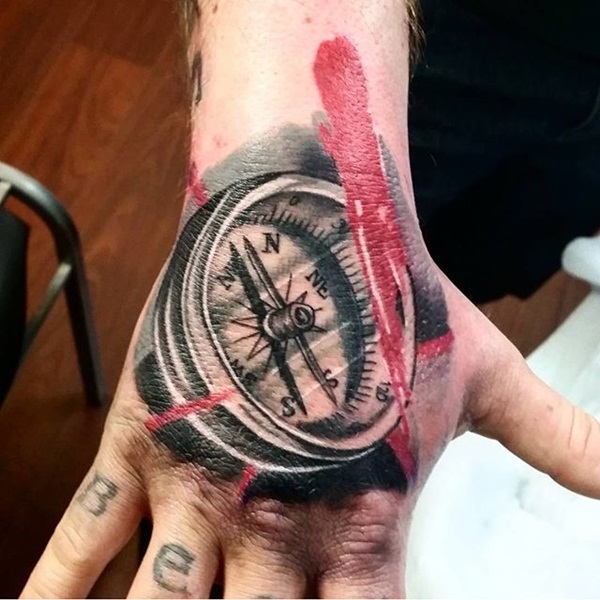 Slashes of red add color to this compass tattoo placed on the hand. 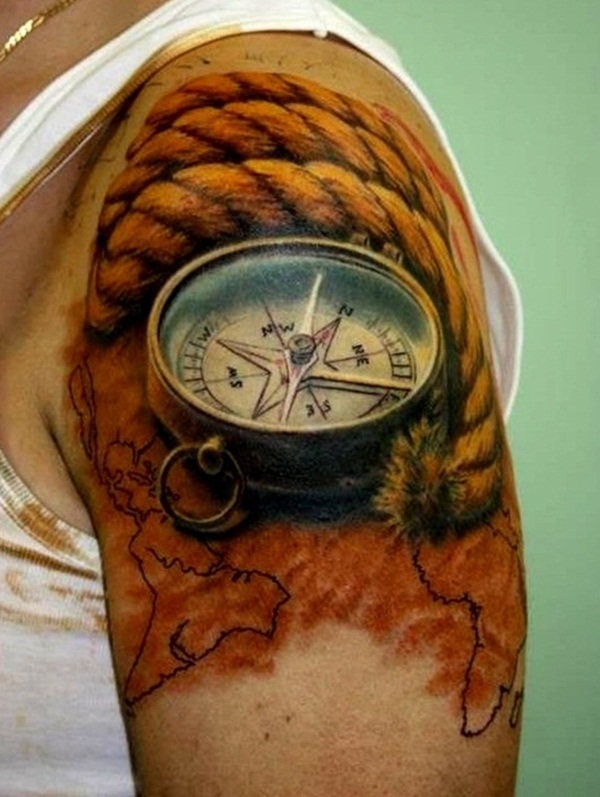 Another arm tattoo that creatively combines the image of a compass with map and floral elements. This lap tattoo evokes a sense of proportion and tranquility. 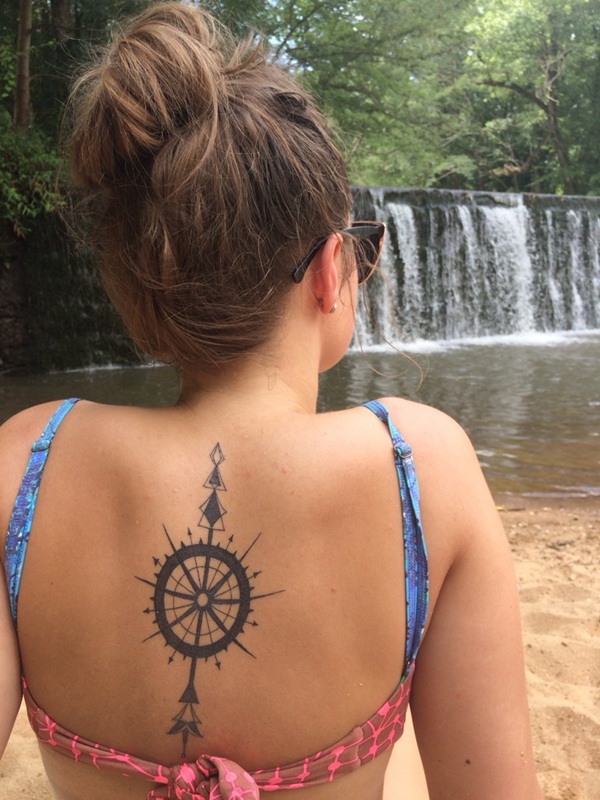 Whether you’re a man or a woman, a floral compass tattoo is a perfect representation of your love for travel. 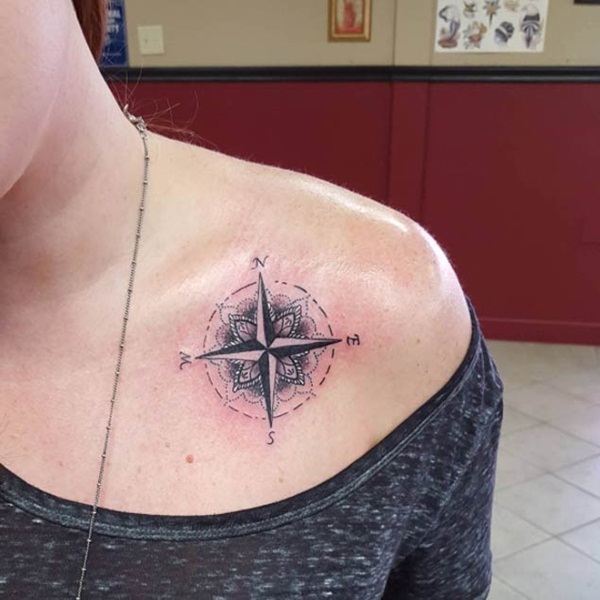 To personalize your compass tattoo, it’s a great idea to ink the name of your hometown or any particular location that’s special to you, especially your favorite travel destination or a place that you’ve always wanted to visit. 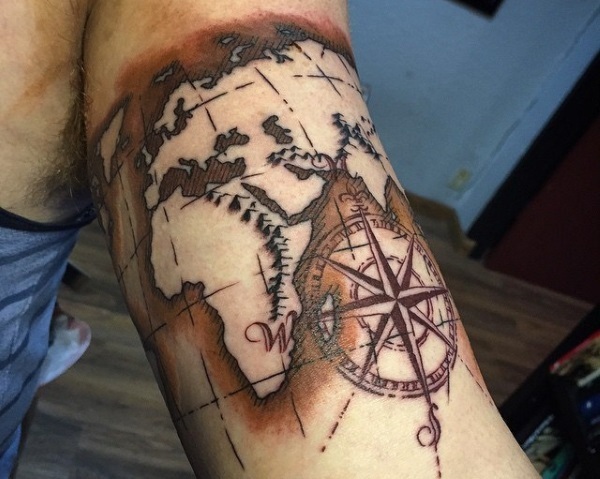 This person’s arm tattoo features the map and name of Nottingham, England, which gives the impression that the person is from this city. 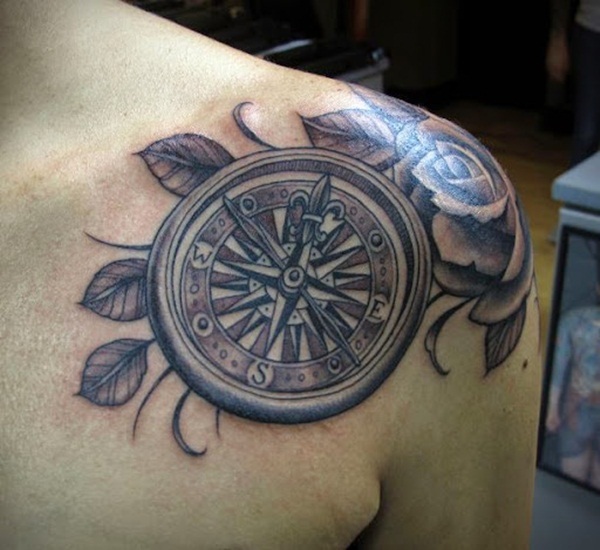 Instead of roses or other flowers, this shoulder and arm tattoo focuses on using thick leaves to highlight the compass. “What’s done is done” is a meaningful phrase that heavily implies acceptance of the past and encourages us to move forward. 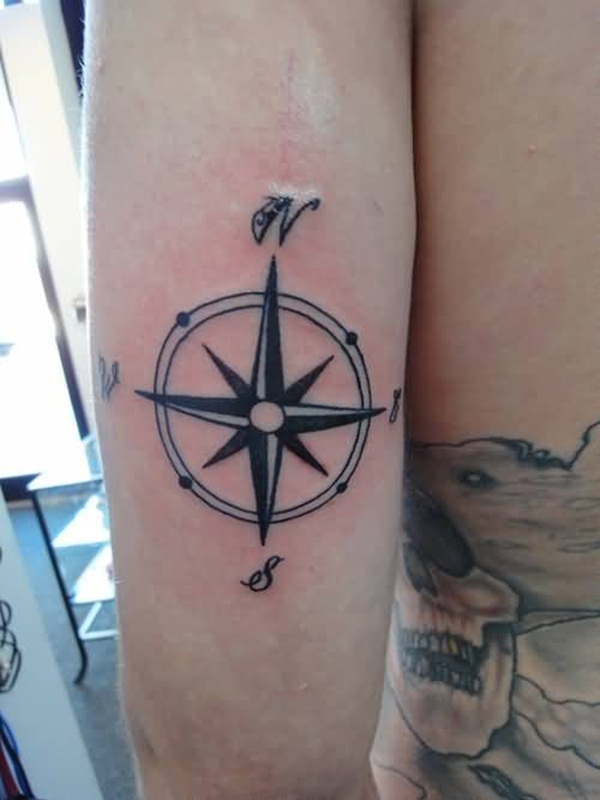 If you’ve done something before that you don’t want to regret anymore, this quotation is a wonderful addition to a compass tattoo. 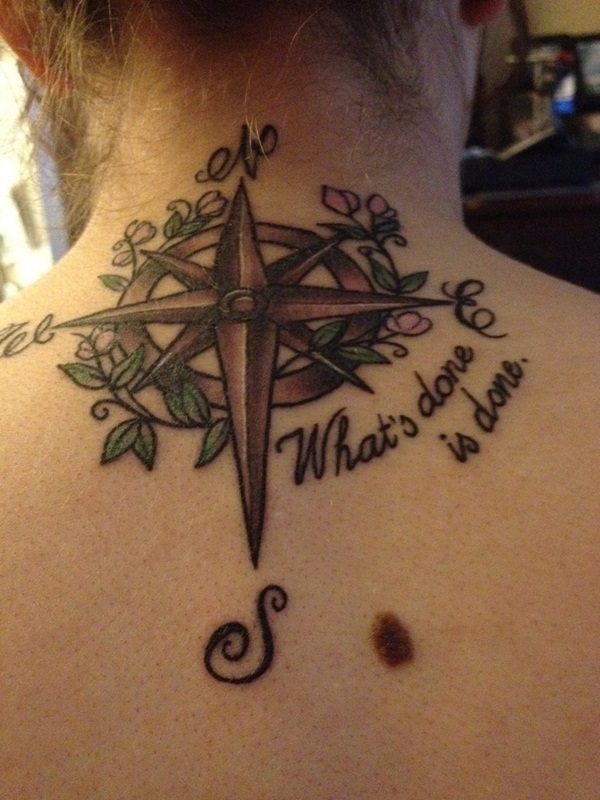 Flowers and leaves intertwined with the compass in this person’s nape tattoo breathe life into the tattoo. 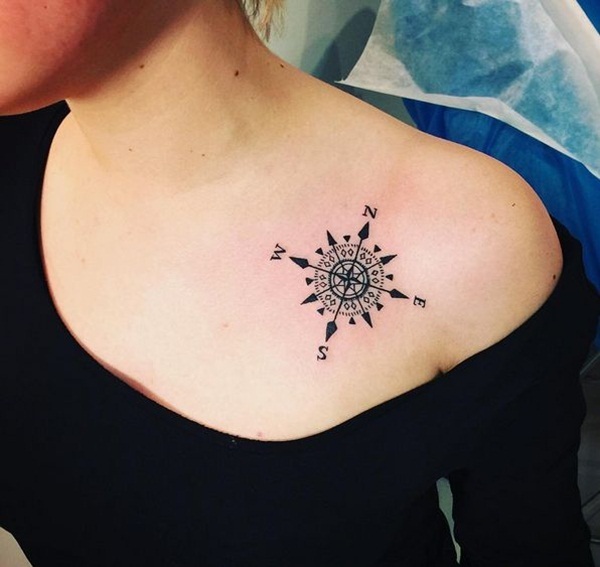 Instead of using the typical star compass or realistic compass, this tattoo uses a feathery arrow and triangular shapes, in which some are shaded while others are not. 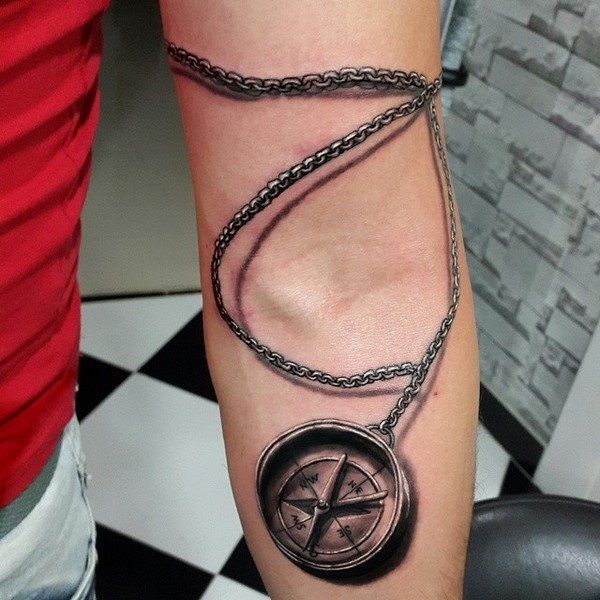 This tattoo doesn’t exactly look impressive and the shape of the compass is far from perfect, but the use of a bead chain adds a bit of impact. 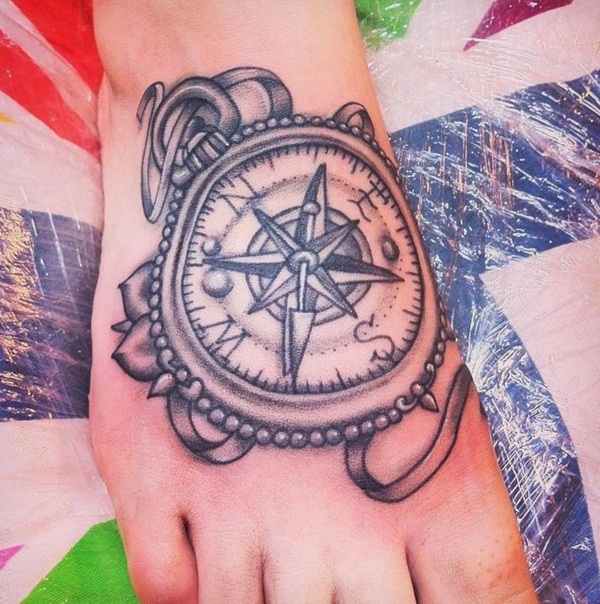 Round beads accentuate this compass tattoo on the foot. 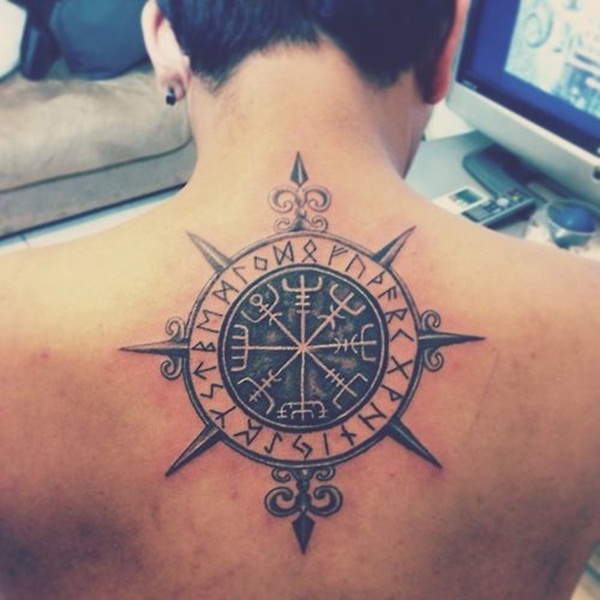 Ancient-like symbols and sharp pointed edges give an edge to this fierce back compass tattoo. 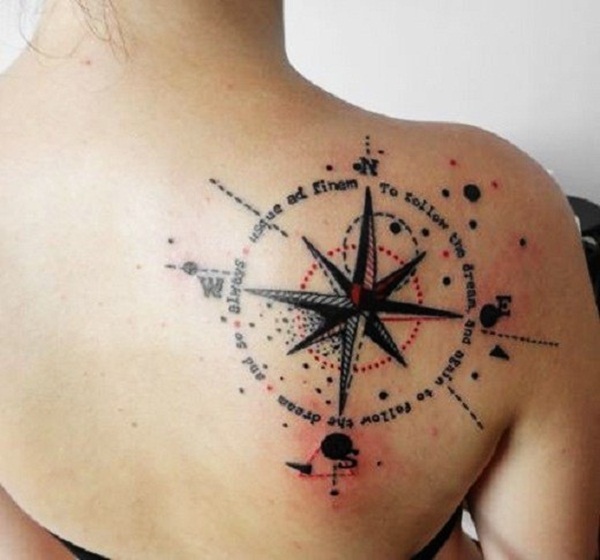 Dark-shaded feathers run down the lap and add texture to this very alluring star compass tattoo.